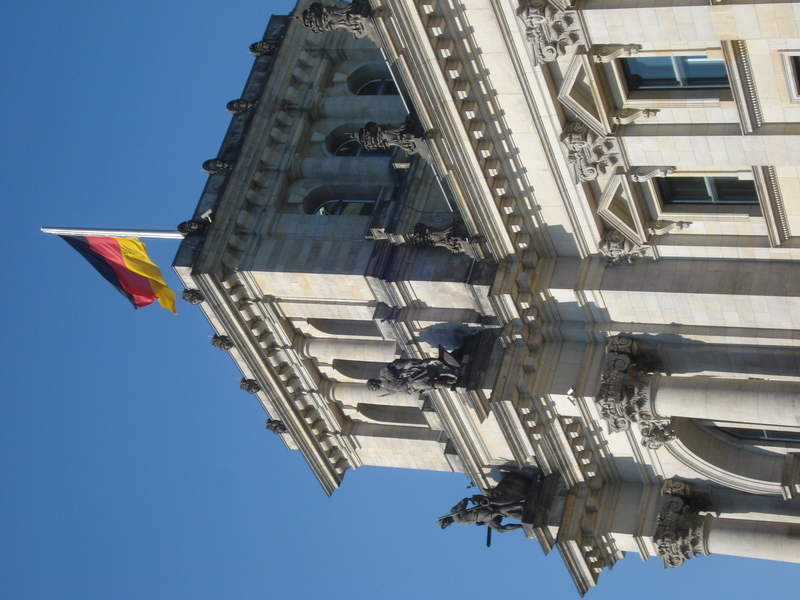 Here is a linguistic curiosity (about written rather than spoken German): . ss can be written as a single letter ß. 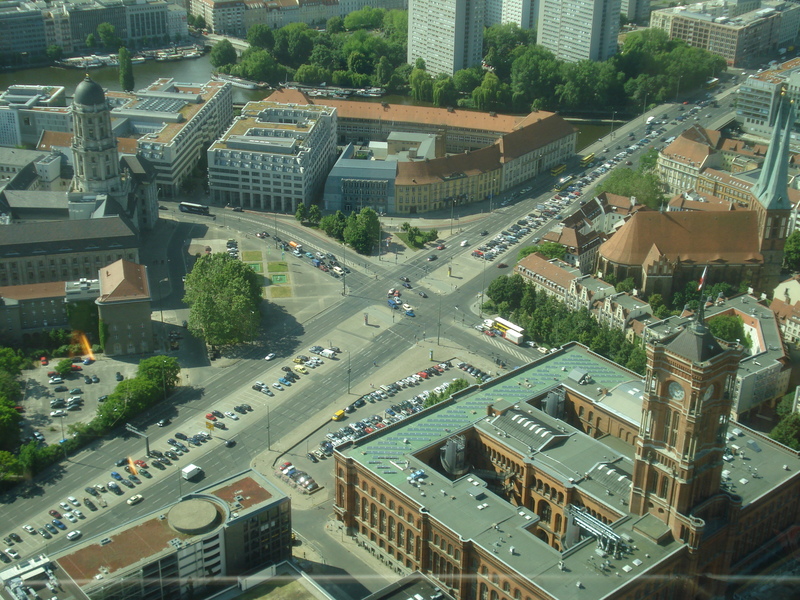 For example street = strasse = straße. And football = fussball =fußball. 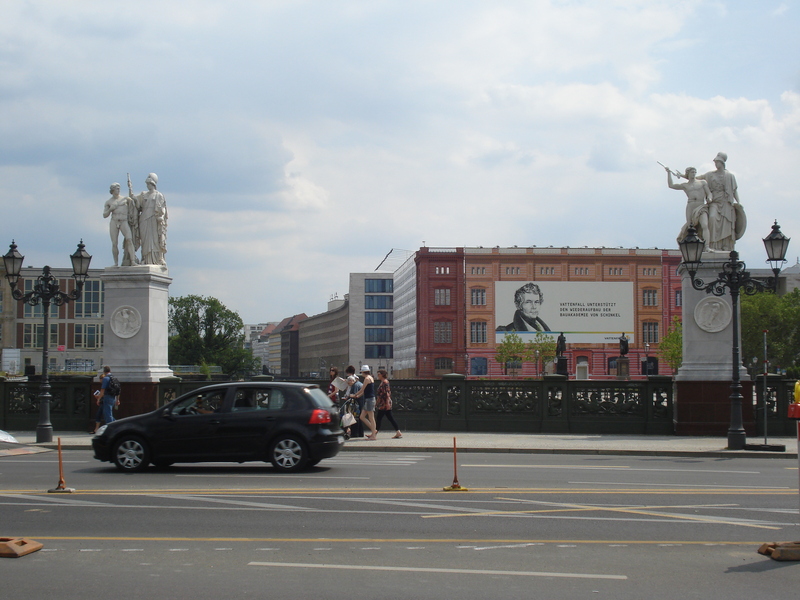 I knew that, but I soon came across street signs in Berlin which initially threw me. 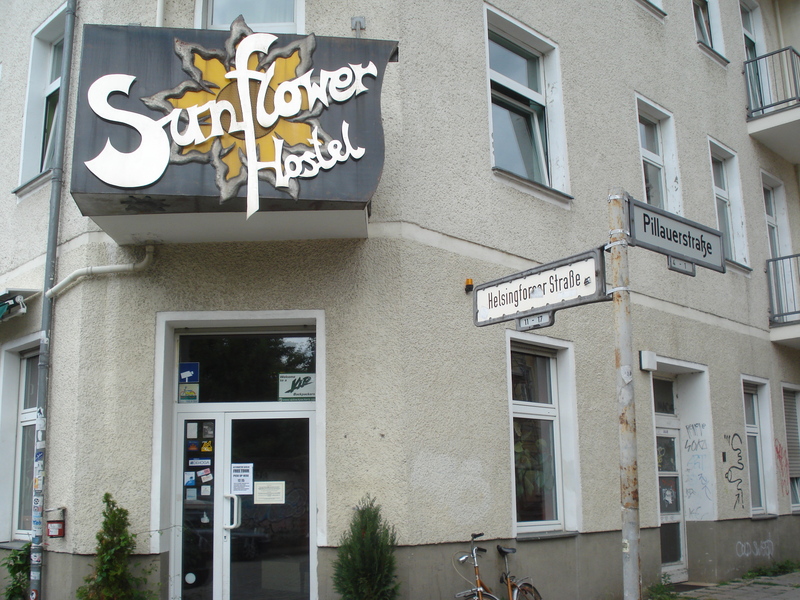 If you look carefully at my photo of the Sunflower hostel you will see that one street sign says Helsingforser Straße, while the other one says Pillauerstraſʒe, except that the ſʒ is written without the space in between. Both forms are really ligatures, that is two letters joined together to form one character, in this case s and z. ſ = long s, and ʒ = z. Although one correct way is to write ss, the more old fashioned way is to write s and z, but joined together. Confusing. 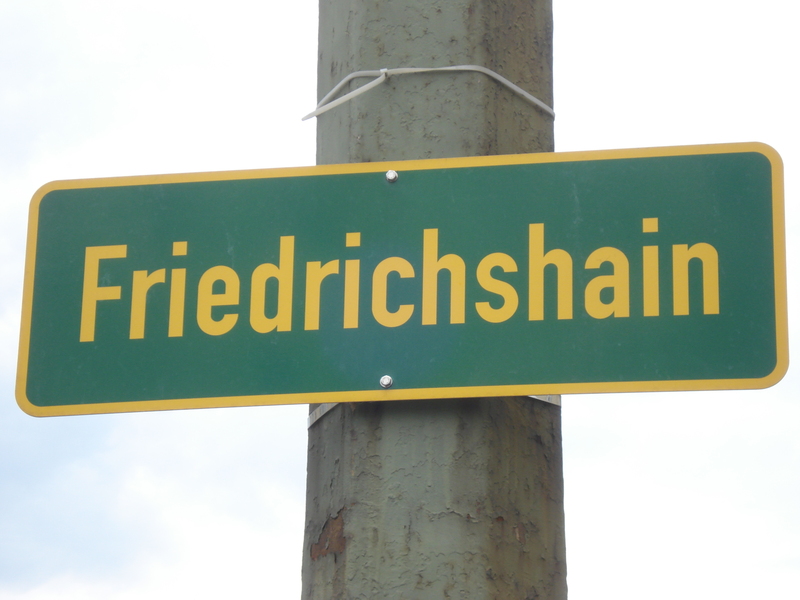 This character still lives on in German, despite a spelling reform of 1996 that was intended to reduce its frequency (but never intended to eliminate it altogether). The Sunflower Hostel has a young fun-loving clientele. My advanced age and preference for melancholy won’t have much affect on that profile. Most of my dorm mates stay out all night and come back to sleep around 7.00am. They are pretty high spirited (I mean noisy) so I generally get up soon after. It’s a bit like changing shifts. 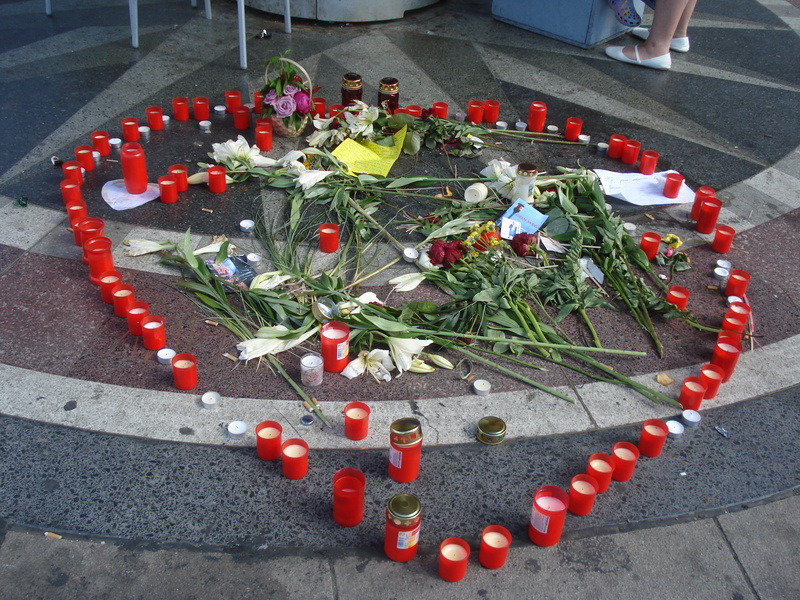 The other night I was watching a World Cup match on the common room TV when in trooped a dozen young guys with their luggage, all identically dressed: T-shirts reading “Danny’s Stag Party”, kilts and sporrans. None of them took my dorm room, thankfully. 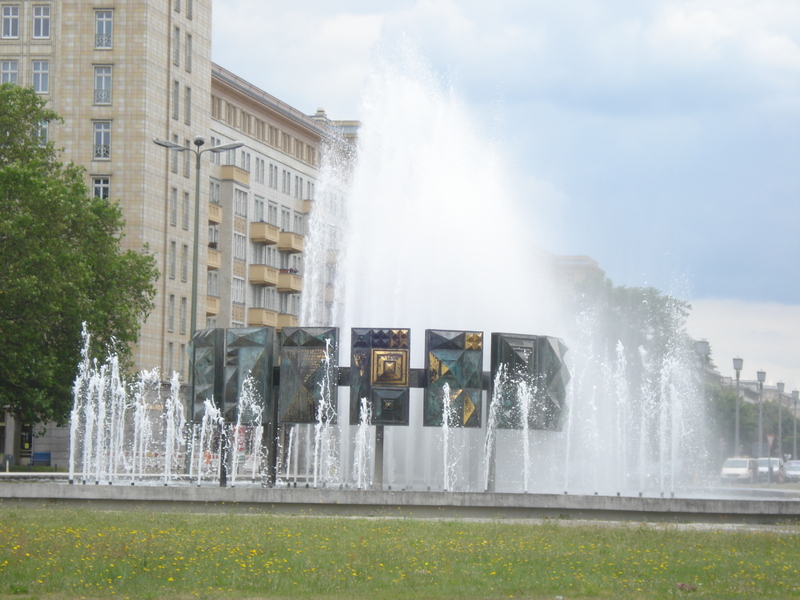 For my exploration today, I first walked to Alexanderplatz, via Ostbahnhof station, then along the East Side Gallery wall until it ran out. 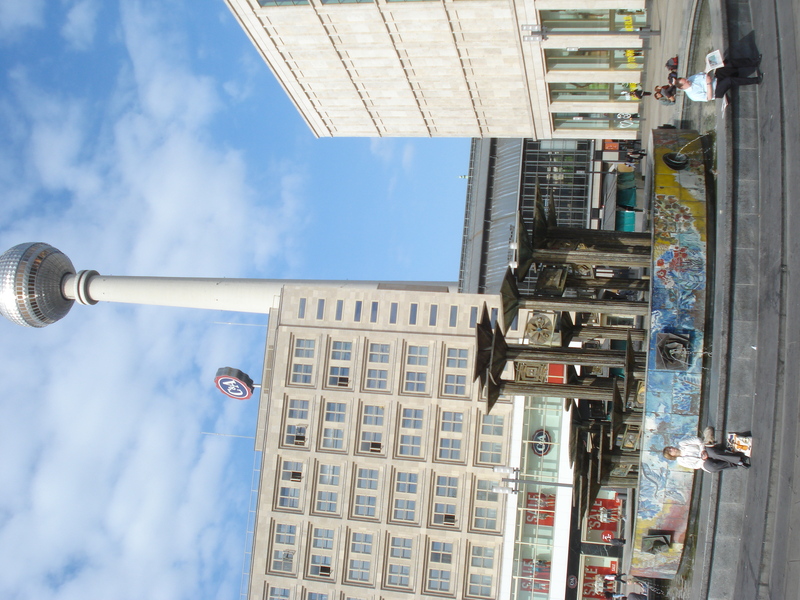 At Alexanderplatz, I encountered a tribute to Michael Jackson and a map of the U-bahn and S-bahn metro. 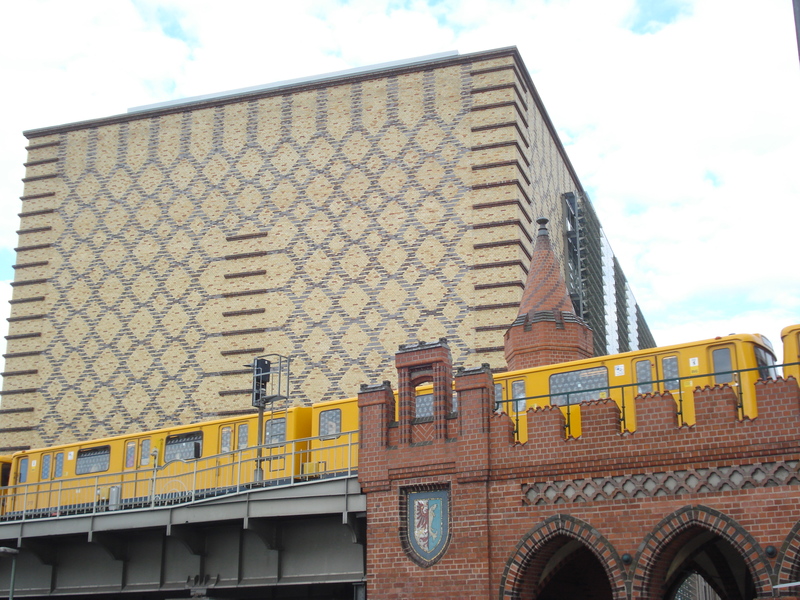 I decided to take the U-bahn in a random direction for a couple of stops. I chose south. 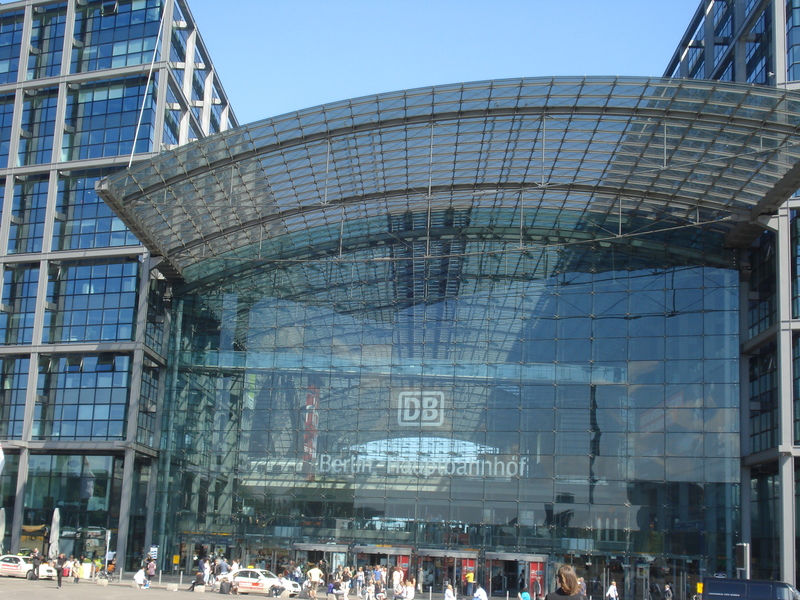 By the way, U-bahn is the city train system that goes underground, while S-bahn is above ground. Both have multiple lines. 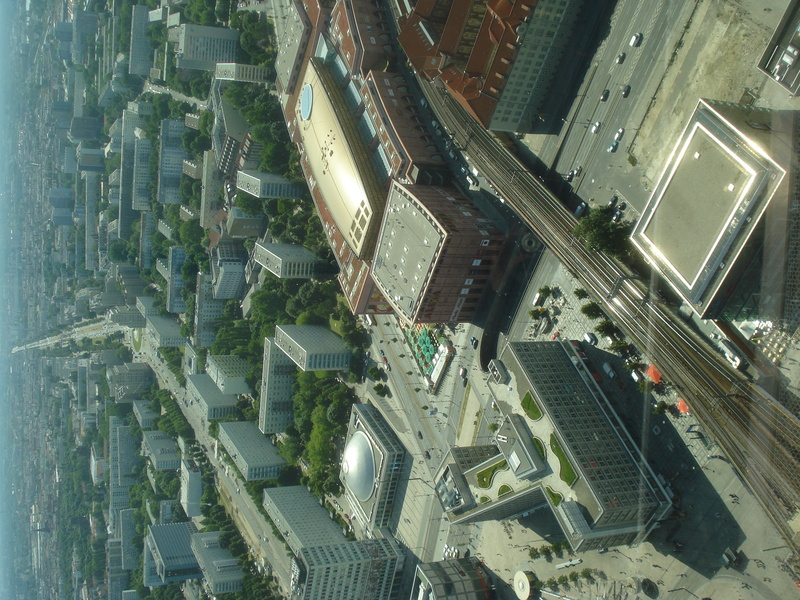 I got out at Stadtmitte station. 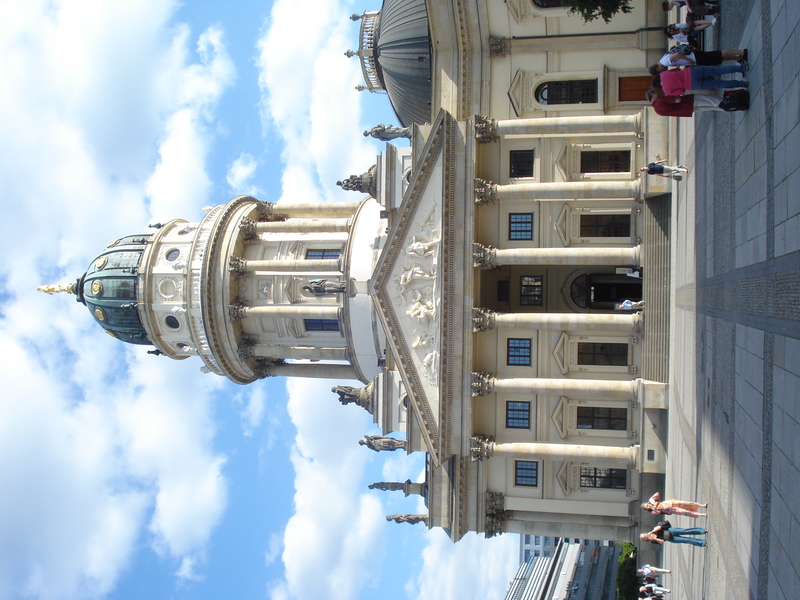 I found a lovely square called Gendarmenmarkt. 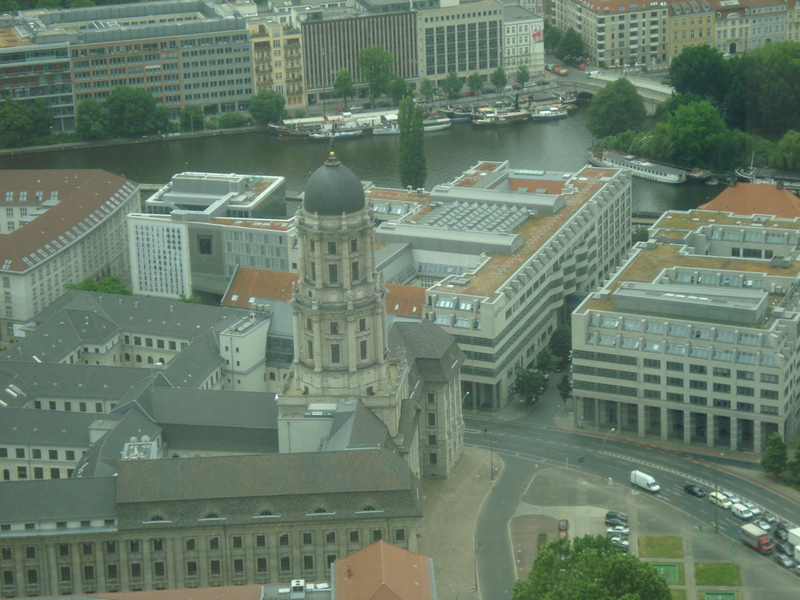 On the north side is Französischer Dom (French Cathedral) and on the south side is Deutscher Dom (German Cathedral). 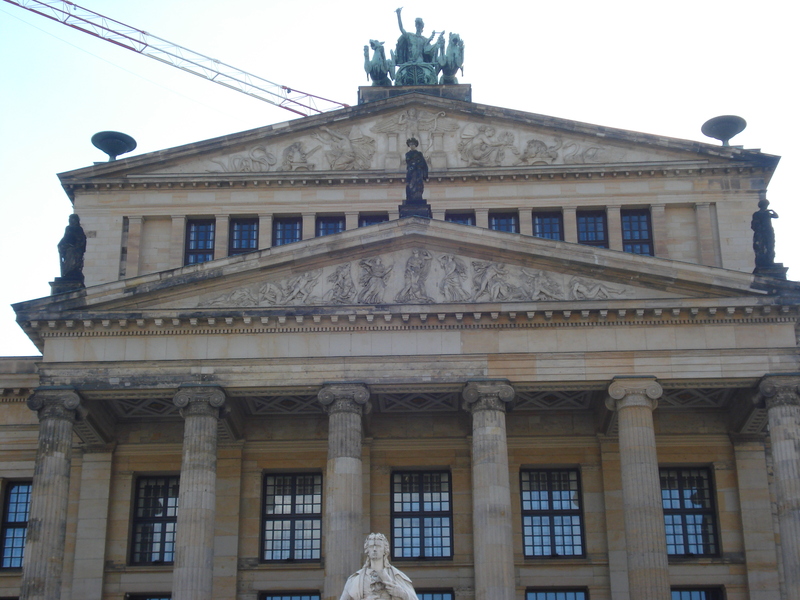 On the west side of the square is the Konzerthaus (Concert Hall). 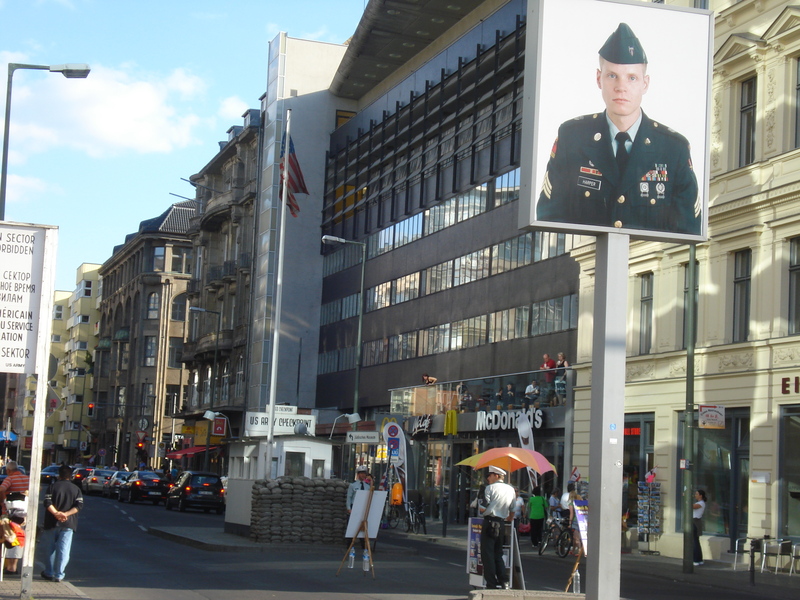 Walking south along Friedrich Strasse I came upon the old Checkpoint Charlie crossing between the American and Soviet sectors. In one way it is a pretty cheesy touristy set up, but on the other hand I get the impression the East-West divide and the Wall are not ancient history for Berliners, but rather that those events are still vivid in their consciousness, even for those too young to remember those times. 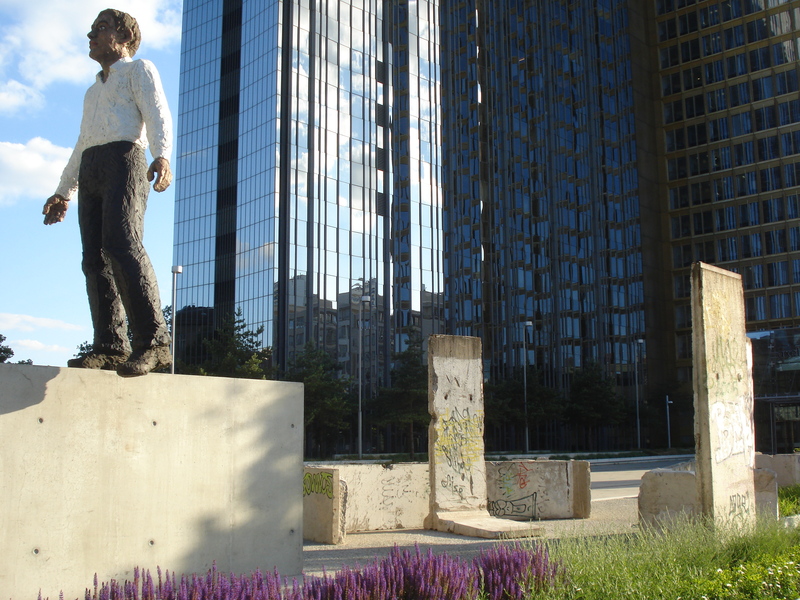 Walking east I came across this 2009 sculpture, “Balancing Act”, with pieces of the original wall. 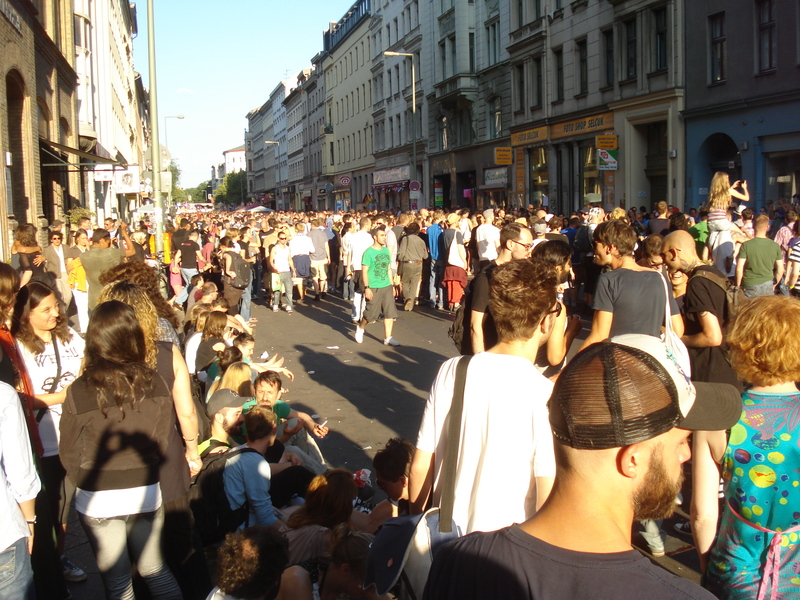 Walking further east I stumbled on a huge street party that took up the whole block on Oranien Str. 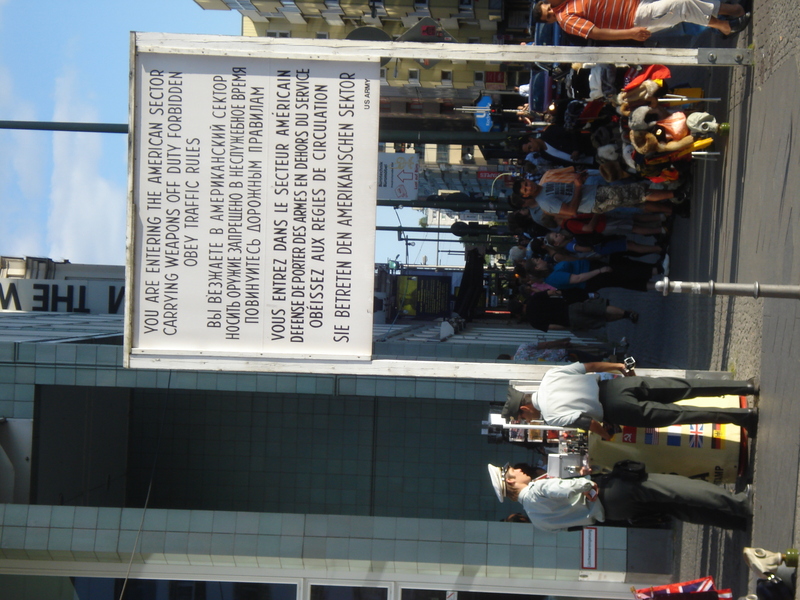 The sign in the first pic reads: “Let’s wear neon for the sick and lonely old”. What a beautiful sentiment. Who says kids today are selfish and not socially aware? I am not exactly sure what it was all about but I think I detected a gay pride theme. And that was before I spotted the guys with bare chests wearing shorts with transparent plastic rears. 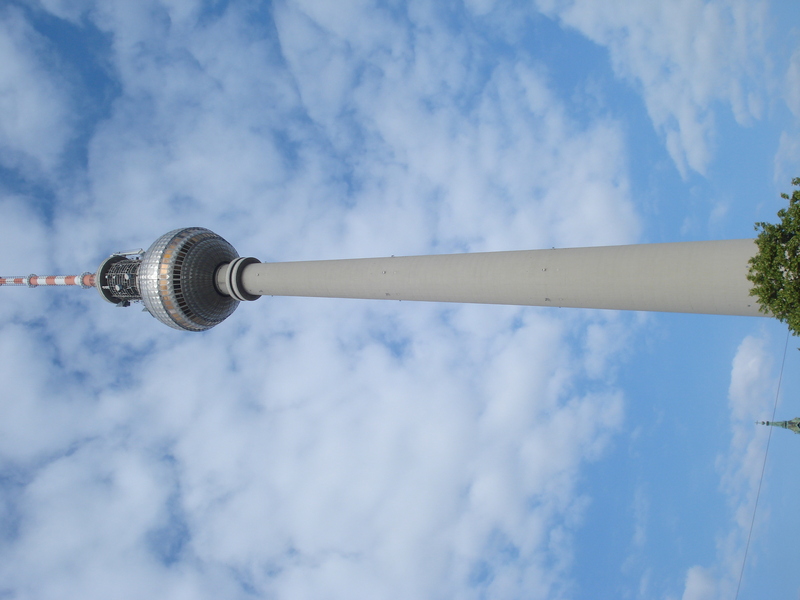 I have identified one factor that has me on edge a bit in Berlin. Cyclists. 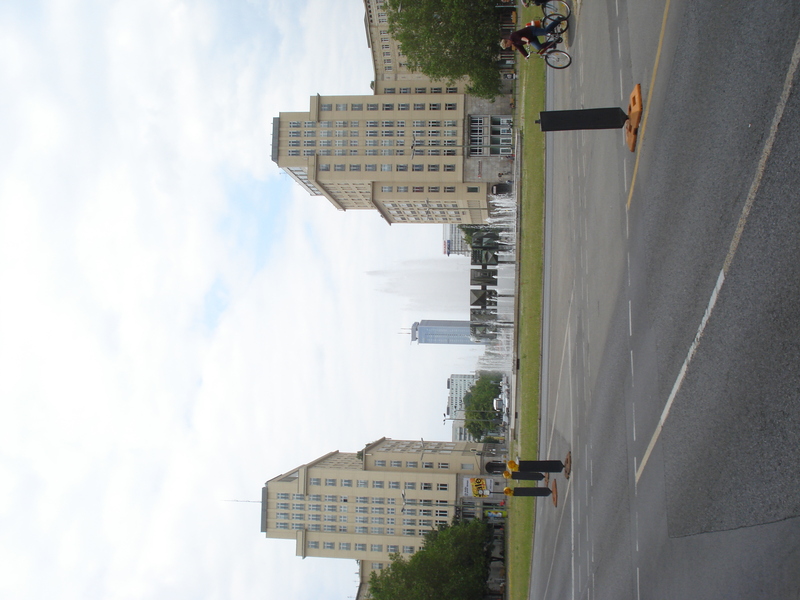 It is a great city for cyclists and they are very numerous and I support that. Most streets have a cycling lane right next to the pedestrian lane on the footpath. A lot of them fairly whizz by. I tend to stray over the line when walking along sometimes, or even forget to look when crossing. I’ve nearly got cleaned up a couple of times. 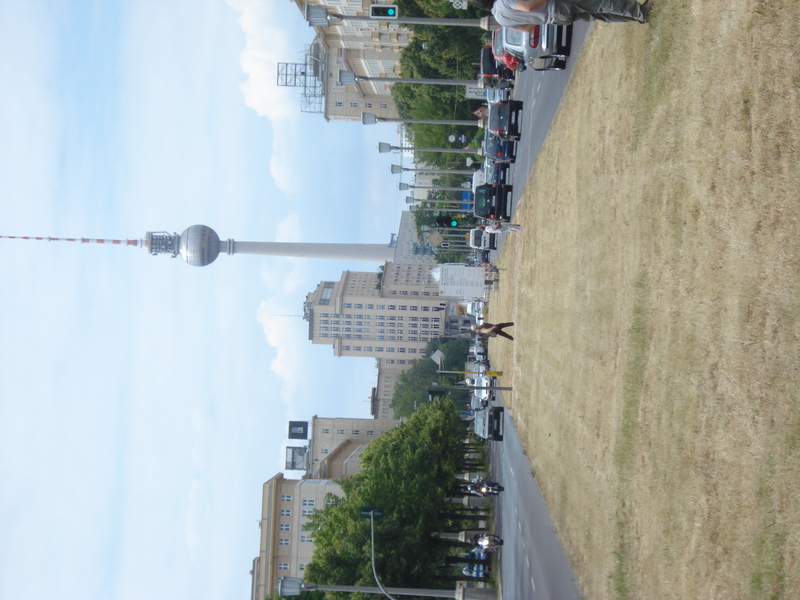 I have enjoyed Berlin. It has been in some ways similar and in many ways different to what I expected. 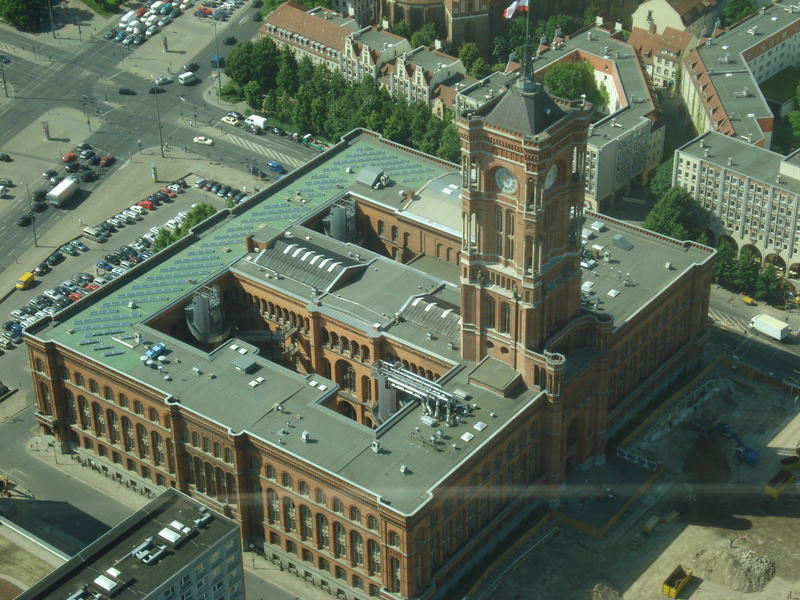 My next post may well be from Gdansk. 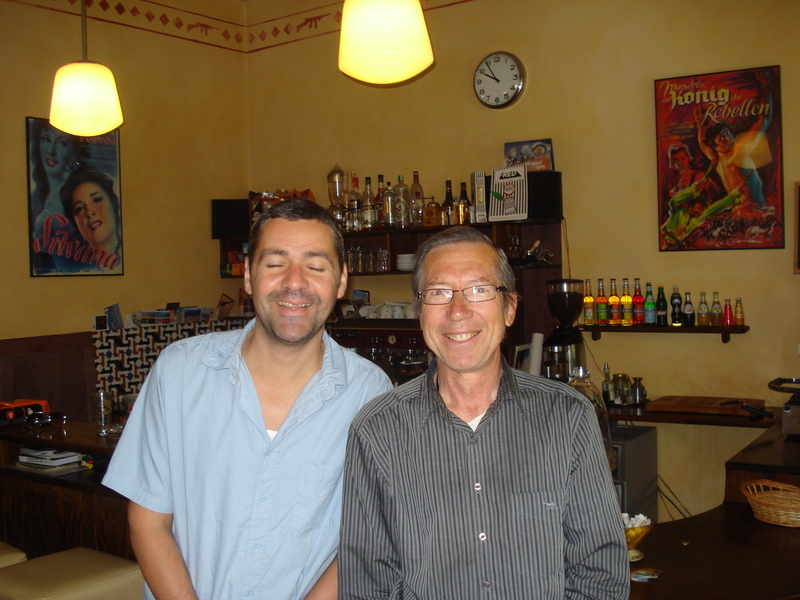 Here is a photo of me with Danny from the coffee shop La Tazza D’Oro. A customer took the pic for us. He said he’d have to take another one because Danny shut his eyes. But then he did the same thing again! I chatted with Danny for a goodly time over my breakfast coffee. He remembers you and says to say hello, Andrew! He showed me a postcard from you dated August 2008 which mentioned a certain incident involving a sharp knife and a finger. Which reminds me that the Melbourne International Film Festival program should be out soon. Here is a photo I took the Thursday evening. Last full moon I was in Venice. 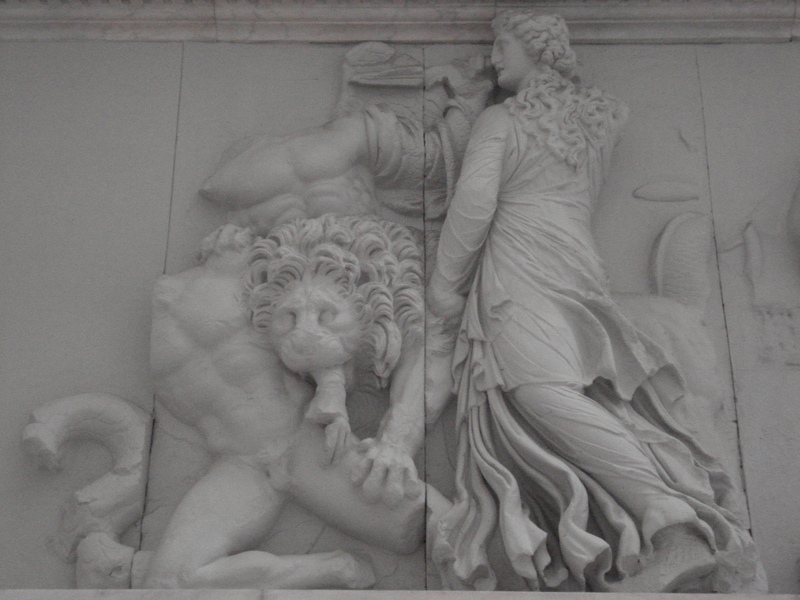 I remember the high tide in Piazza San Marco. 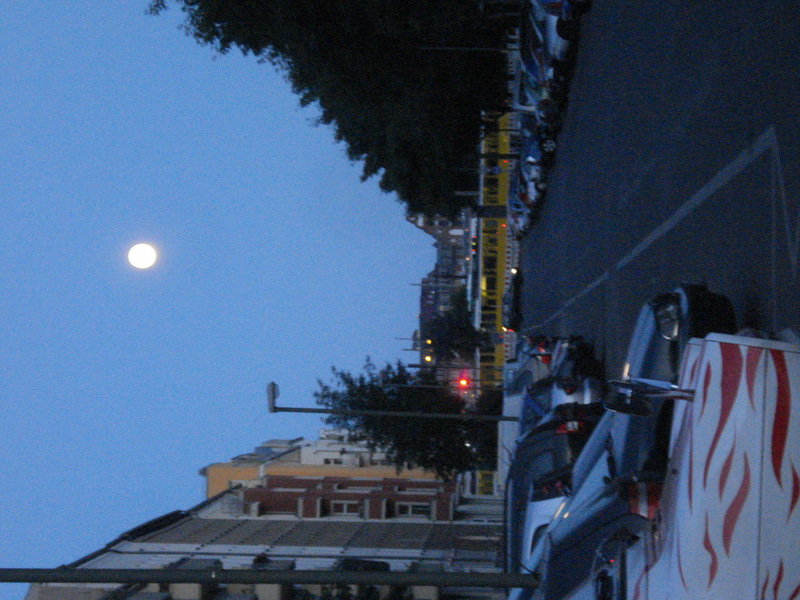 And next full moon I will be back home in Melbourne! 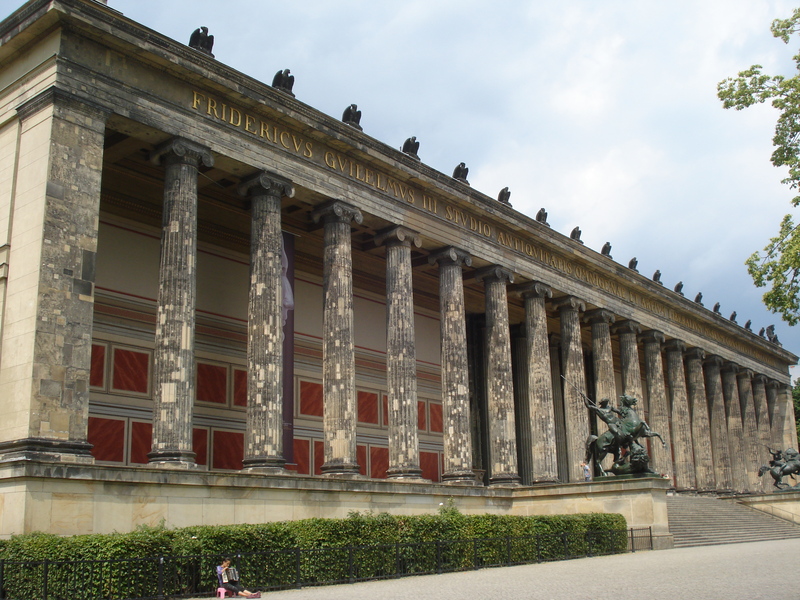 Today I went to Museuminsel (Museum Island) in the River Spree. 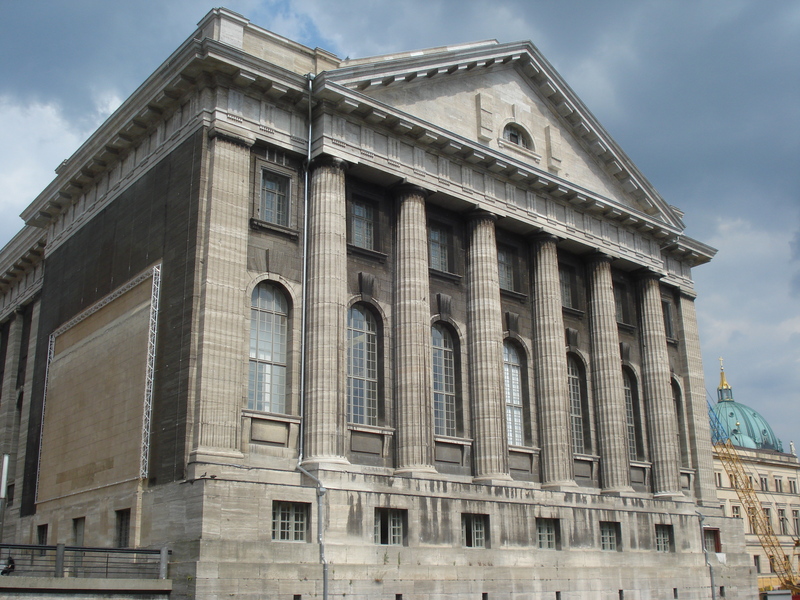 If you like museums and you get the chance to visit here, you will think you have died and gone to heaven. 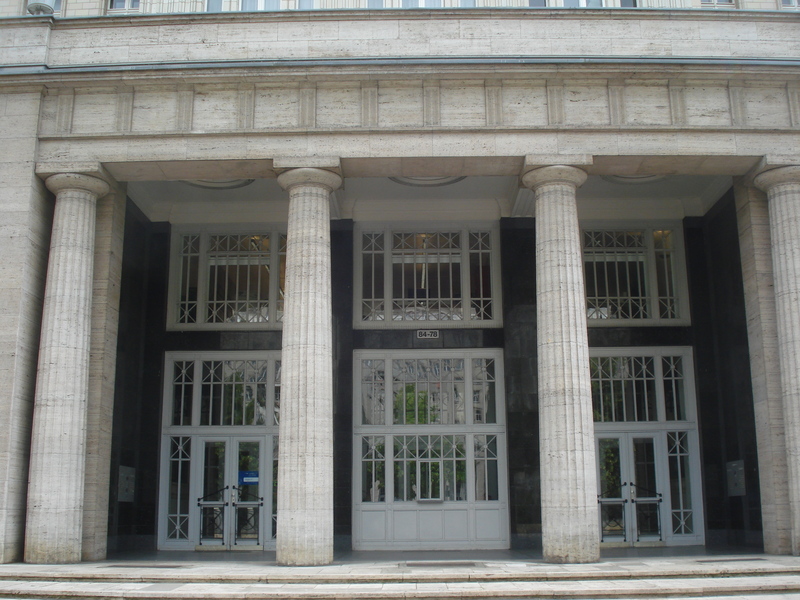 I got the 3-day pass to all the museums, so I can dip in and out of them whenever I want over the weekend, before I leave Berlin on Monday. 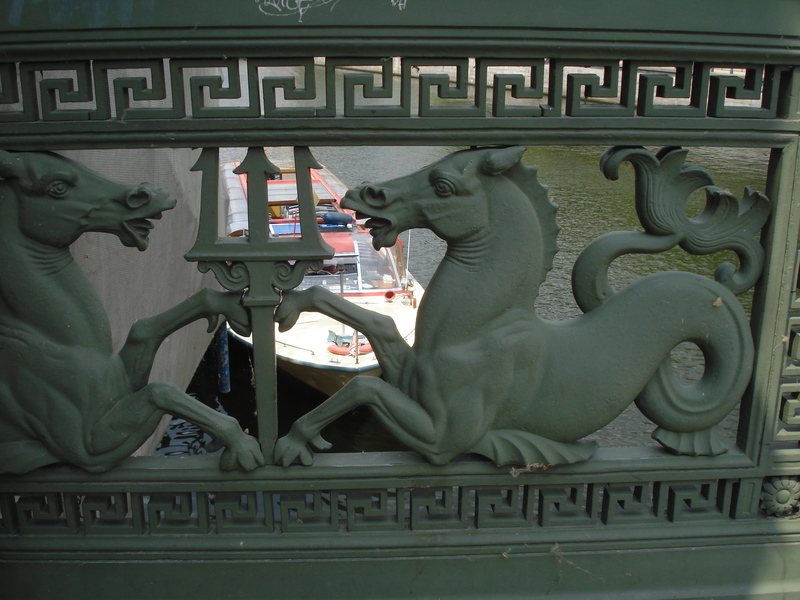 One of the bridges to Museuminsel is the Schlossbrucke, with statues of white Carrara marble and a wrought iron balustrade depicting sea creatures. 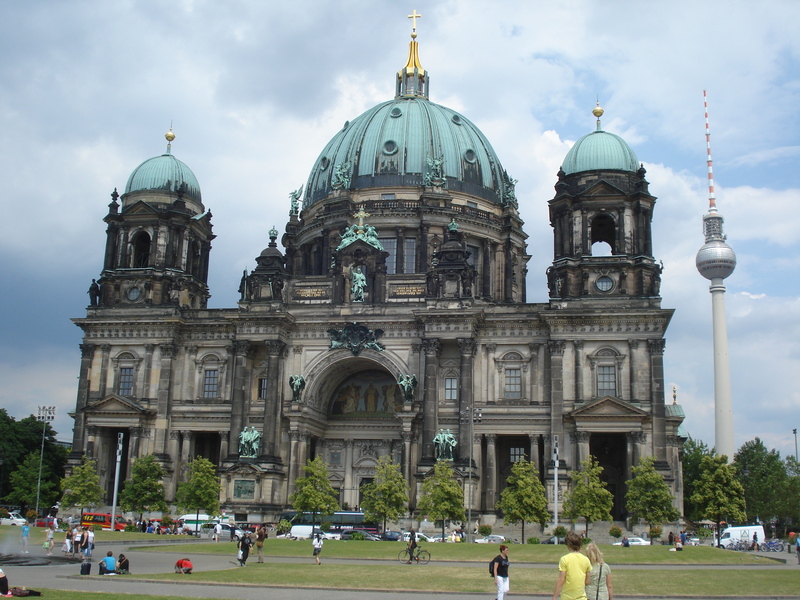 Museuminsel is where Berliner Dom (Berlin Cathedral) is located. 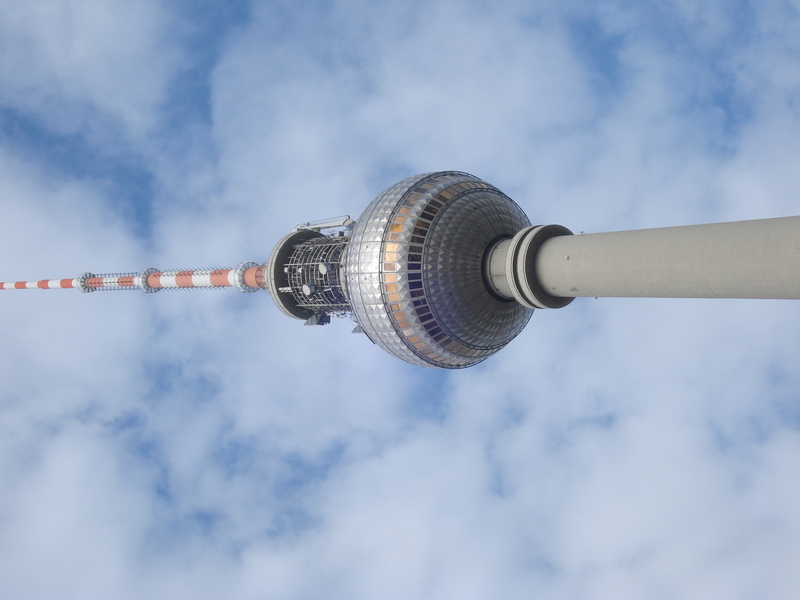 The bell rang when I was there and I watched it sway back and forth in the tower. 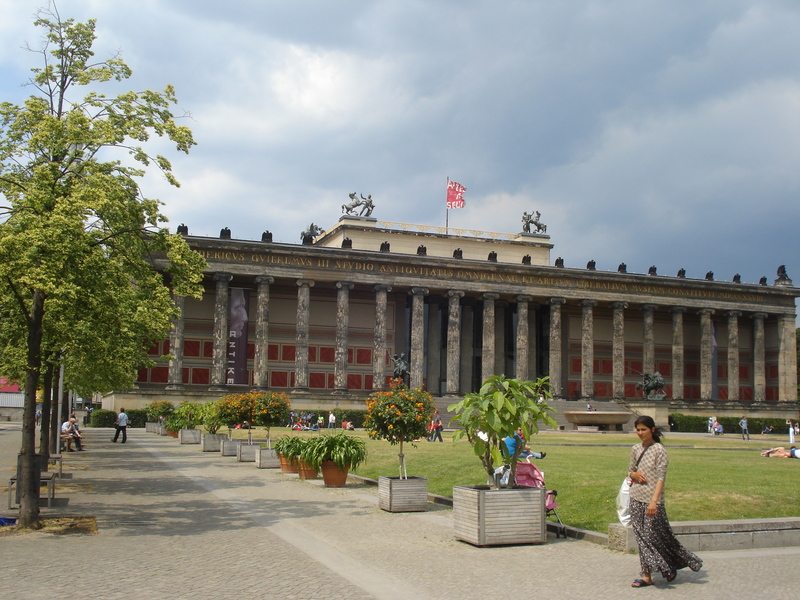 The Altes Museum (Old Museum) is next door, with the Lustgarten in front (not nearly as X-rated as the name suggests to an English speaker). 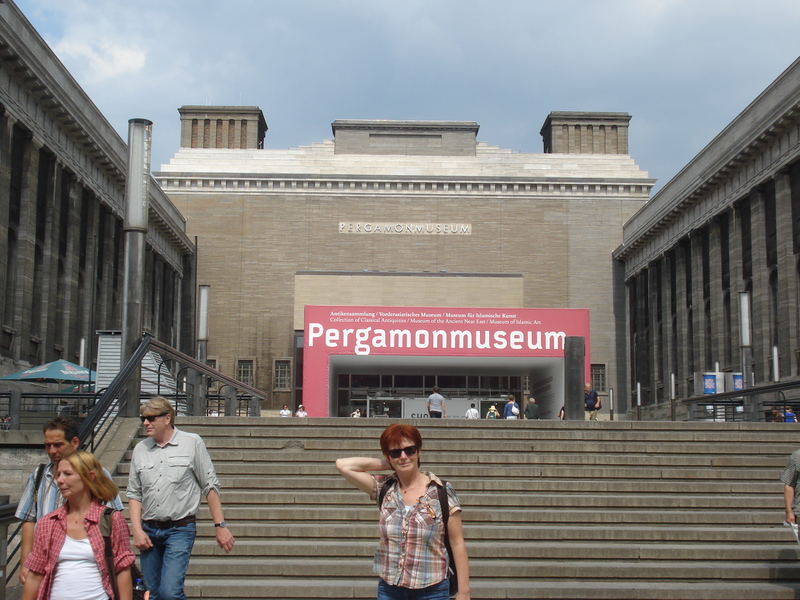 Today I mainly concentrated on exploring the Pergamon Museum with its ancient Roman, Greek and Babylonian/Assyrian art and architecture, but I also briefly visited the Neues (New) Museum to see the famous bust of Queen Nefertiti sculptured in about 1345BC from a limestone core (no photos allowed but you have seen it before). 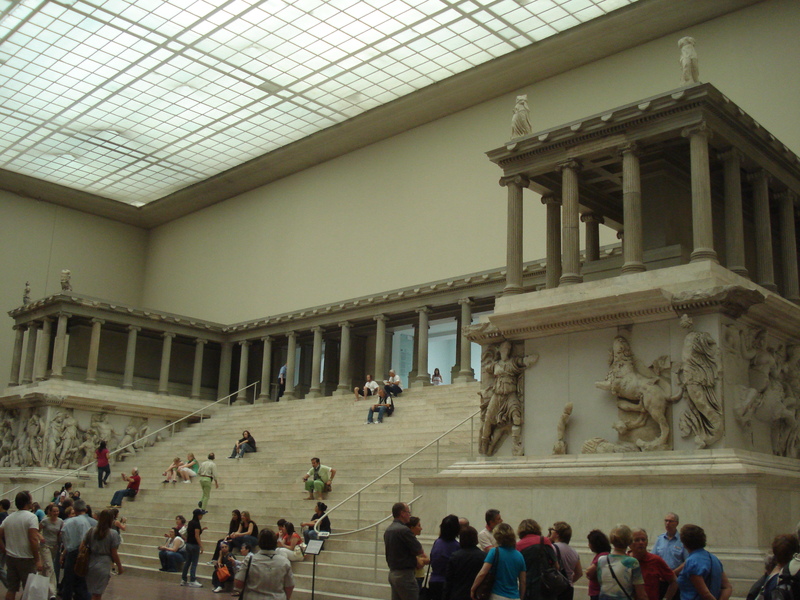 At the Pergamon Museum I first looked at the huge room with a reconstruction of the Pergamon Altar (from an ancient Greek city in present day Turkey, ca 170 BC). The size of the room gives a good idea of the scale of the altar and a model displays its part in a much larger complex. 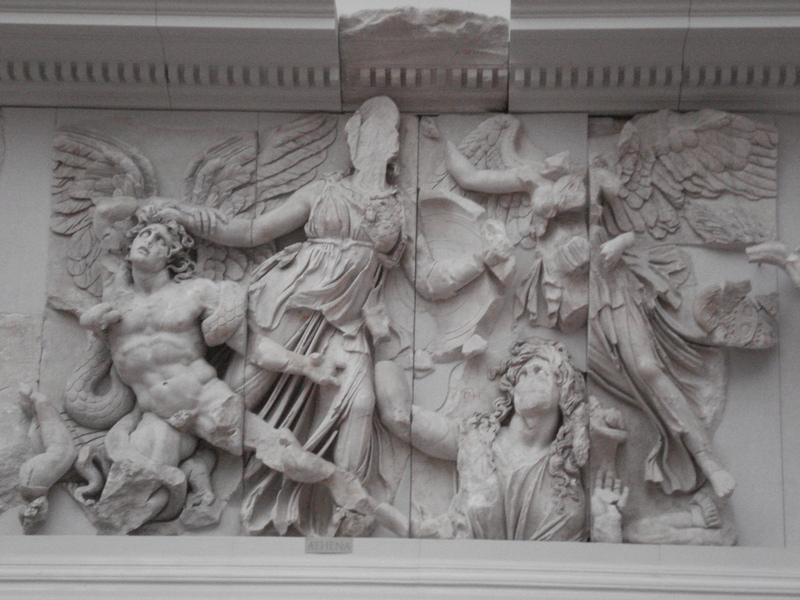 A huge frieze depicts the battle of the gods against the giants. 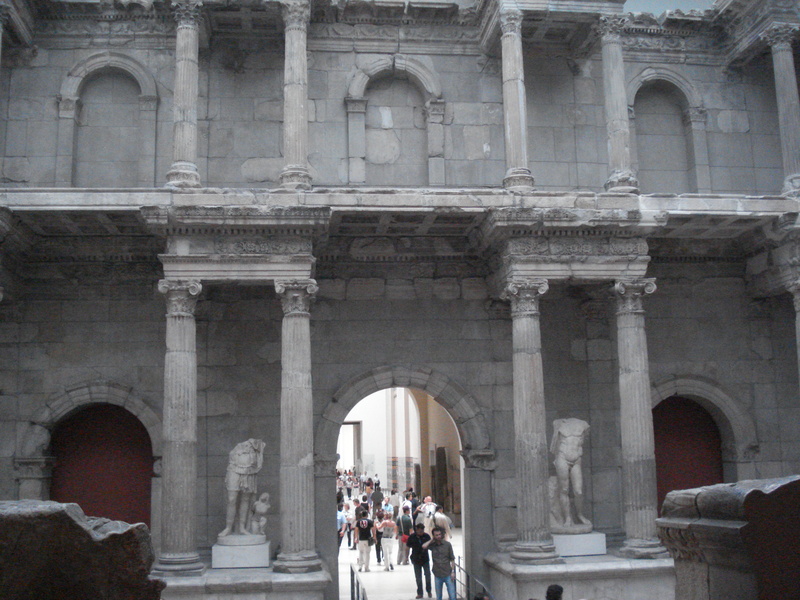 Next was the Ancient Roman display, including the Market Gate from Miletus (a Roman town in Asia Minor). 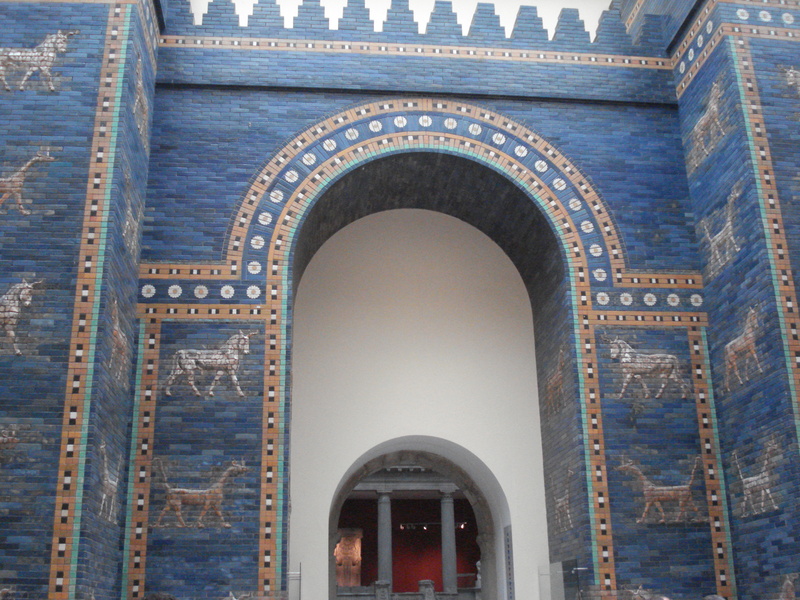 Last, but not least, the fabulous Ishtar Gate (575BC) from the entrance to the palace of King Nebuchadnezzar II of Babylon (which was 100km or so from present day Baghdad) and the Processional Way that leads up to it, featuring beautiful coloured glazed bricks. 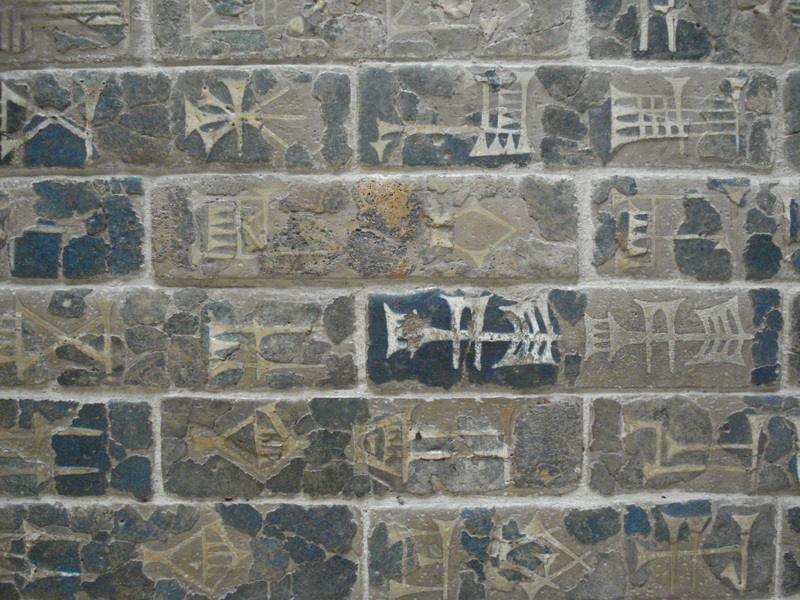 The cuneiform inscription is in the extinct Akkadian language and has been translated. 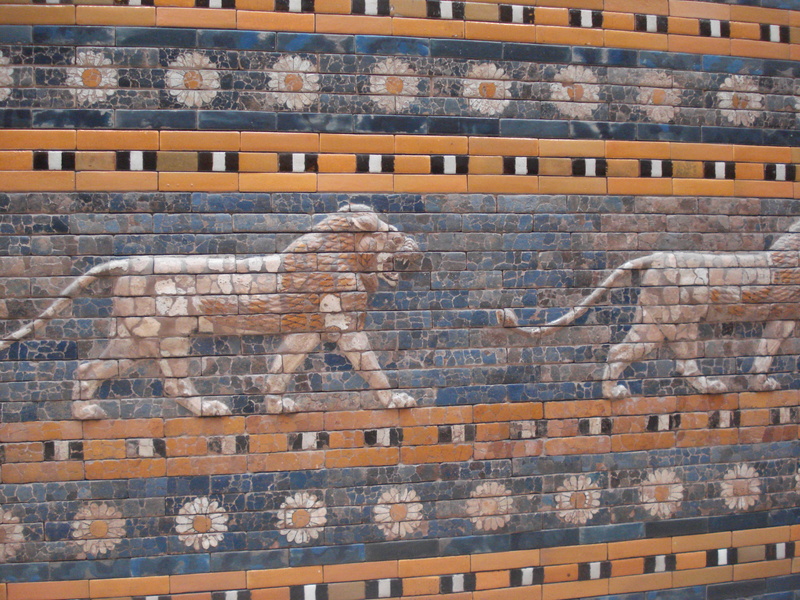 It reads: “Nebuchadnezzar, King of Babylon, the faithful prince appointed by the will of Marduk, the highest of princely princes, beloved of Nabu, of prudent counsel, who has learned to embrace wisdom, who fathomed their divine being and reveres their majesty, the untiring governor, who always takes to heart the care of the cult of Esagila and Ezida and is constantly concerned with the well-being of Babylon and Borsippa, the wise, the humble, the caretaker of Esagila and Ezida, the firstborn son of Nabopolassar, the King of Babylon. 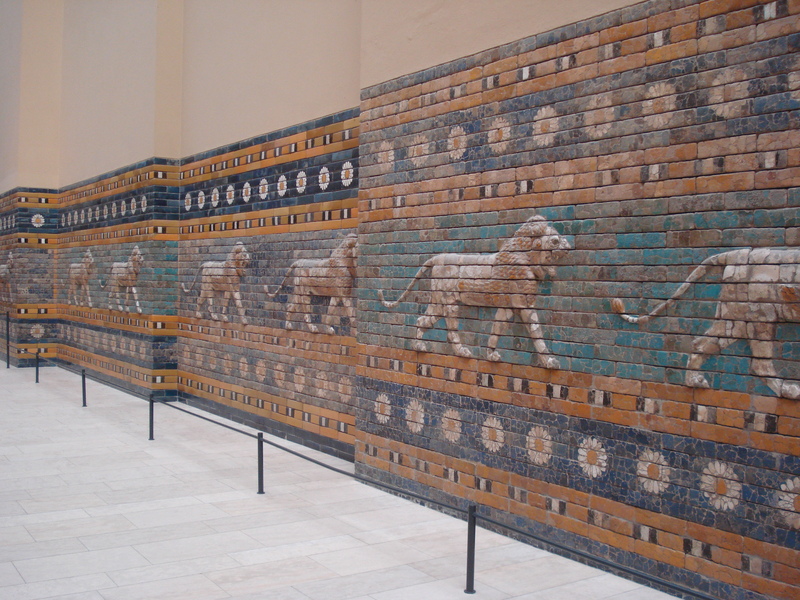 It is hypothesised that the Hanging Gardens of Babylon (one of the seven wonders of the ancient world) were part of this temple complex. On Friday night I went to see the band “Woolly Bandits” at Wild at Heart in Kreuzberg. I have no pics because my camera battery ran out of juice and for the first time on the trip I forgot to recharge the backup. My bad. It won’t happen again. Two guys in the band (bass player and keys) were probably from the 60s band The Seeds. 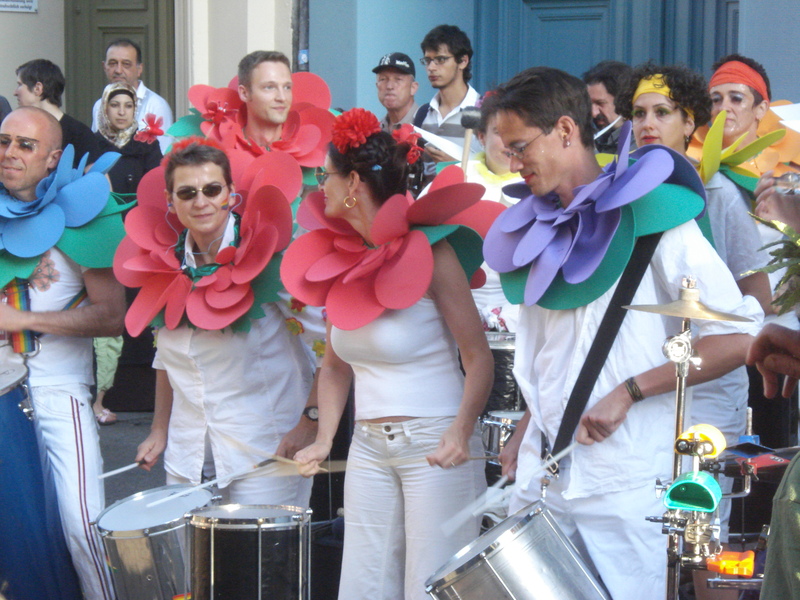 Other members were a guitar player, a female drummer wearing a black cocktail dress and a Madame Lash-like vocalist. She carried a whip as well as a tambourine and gave a couple of male punters six of the best (with the whip, not the tambourine). She even climbed up on the bar at one stage. Fun. The T-shirt for sale listed the dates of their European Tour, starting May 28 in Switzerland, then 23 more gigs through France, Spain, Italy and Germany. This was their last gig. 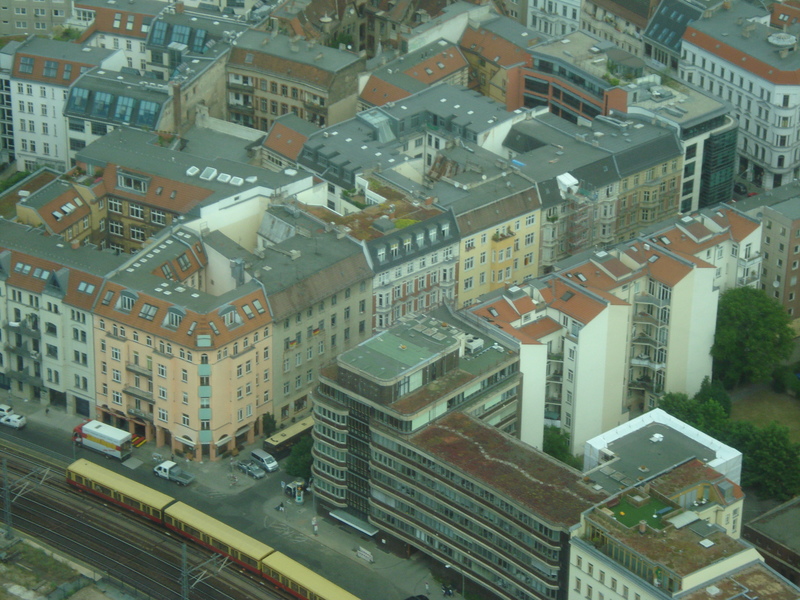 Although it was close to 1am when I left, the U-bahn trains were still running and I managed to catch one to travel the two stops to my hostel. Time to go out and explore some more. 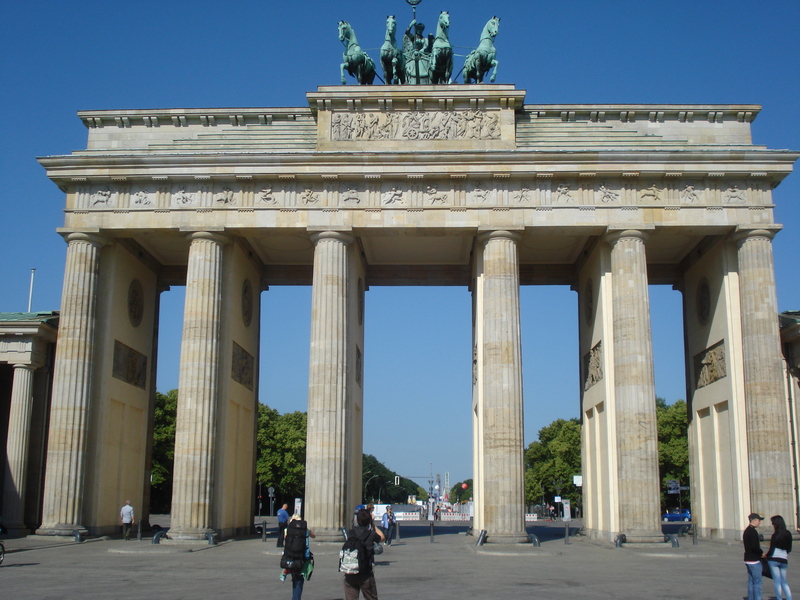 This is the Brandenburger Tor (Brandenburg Gate), symbol of Berlin since 1791. 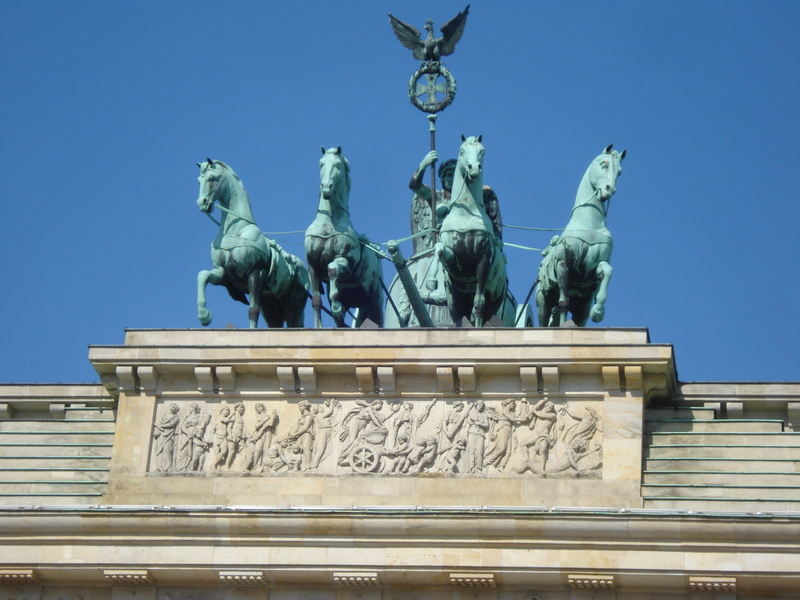 The copper plated sculpture of the Goddess of Victory driving a chariot with four horses (the Quadriga) was taken to Paris by Napoleon in 1806 and brought back after his defeat in 1814. 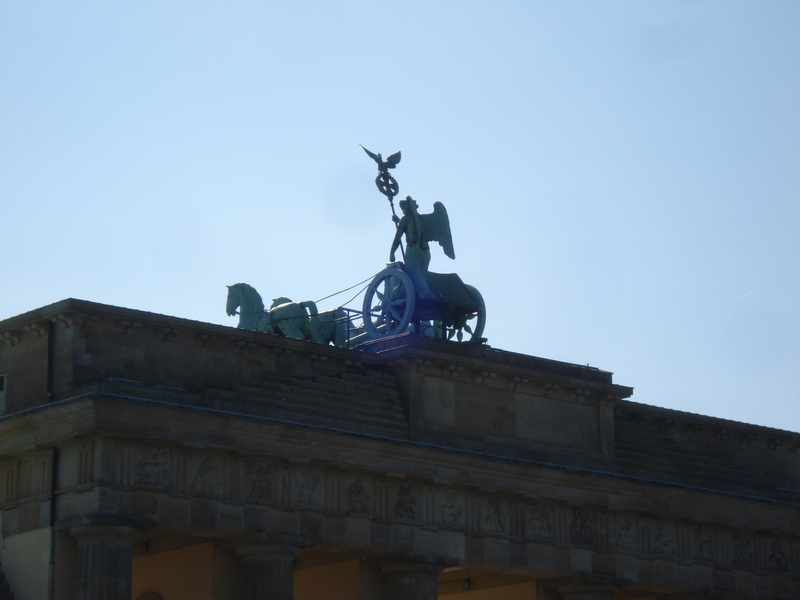 Brandenburg Gate was badly damaged during WW2, the Quadriga reduced to scrap. 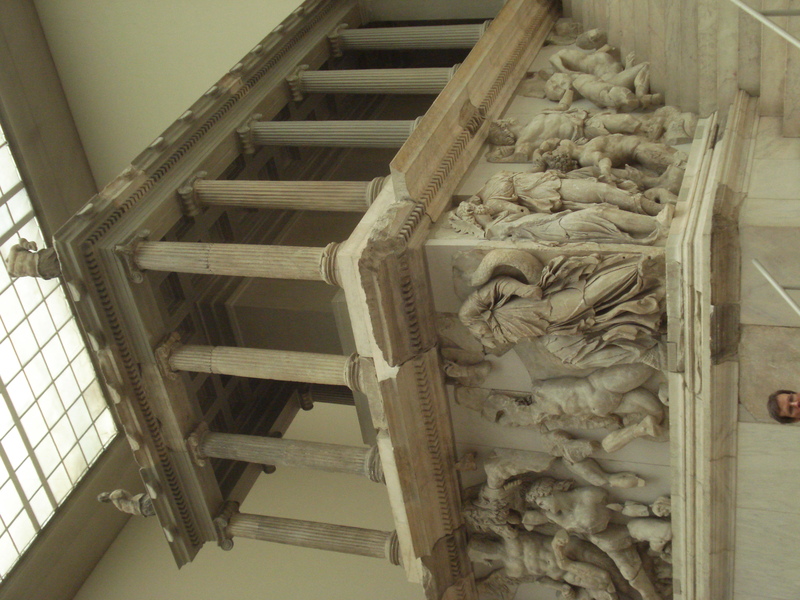 But the original moulds survived and the Quadriga was recast. 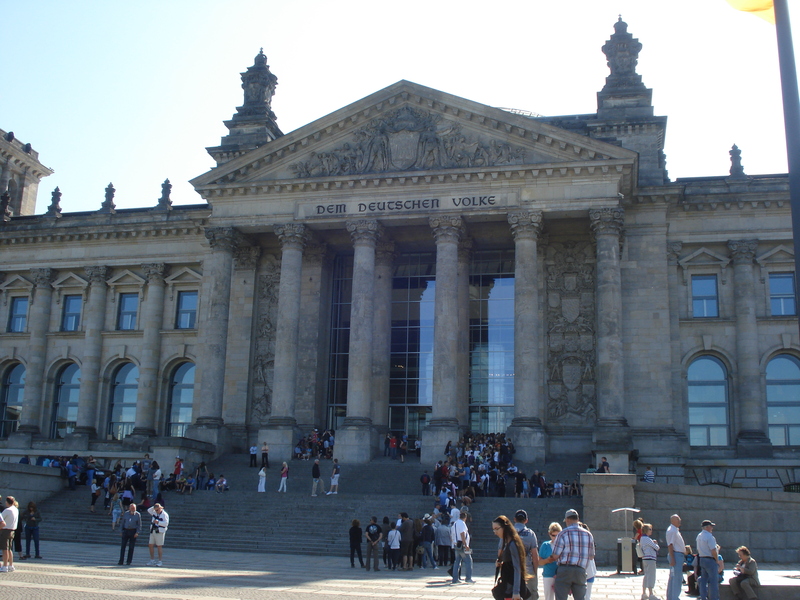 Nearby is the Reichstag building where the German parliament sits. 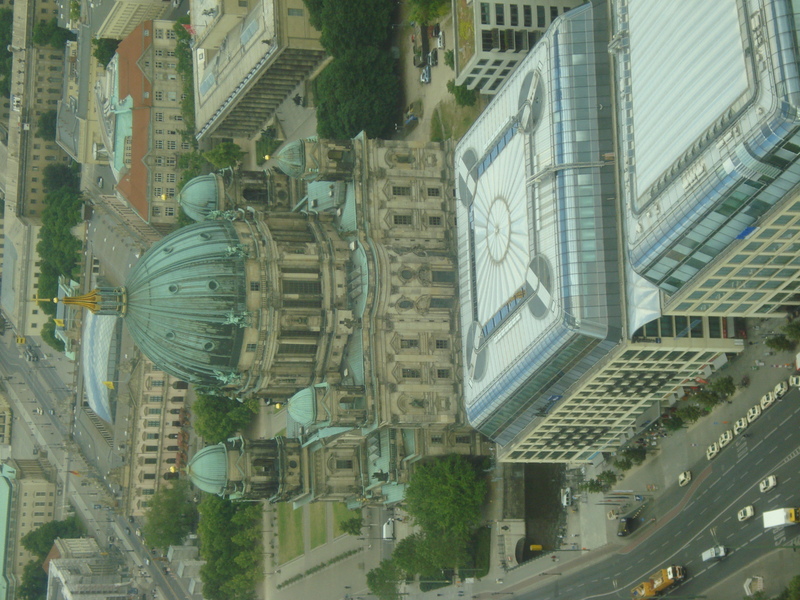 The glass dome was added in 1999. 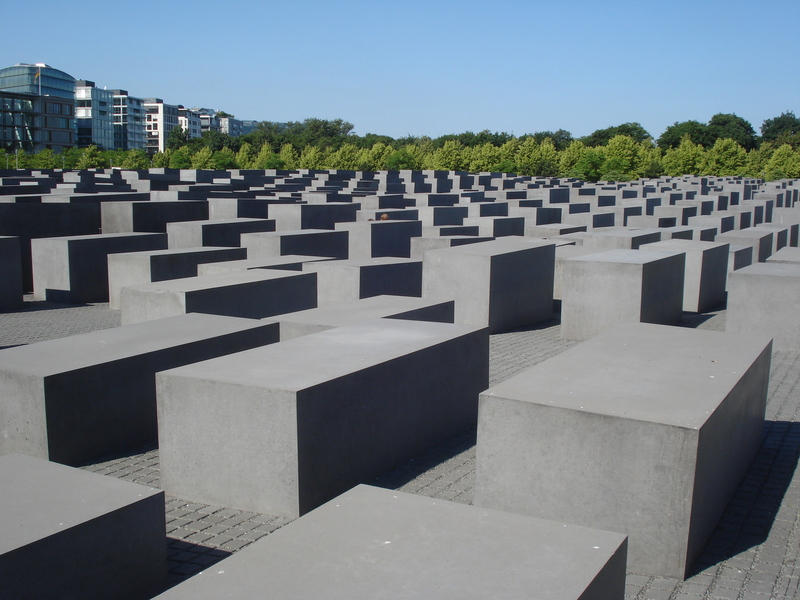 Also close by is the Holocaust memorial to the murdered Jews of Europe, consisting of thousands of tombstone-like slabs in a grid. 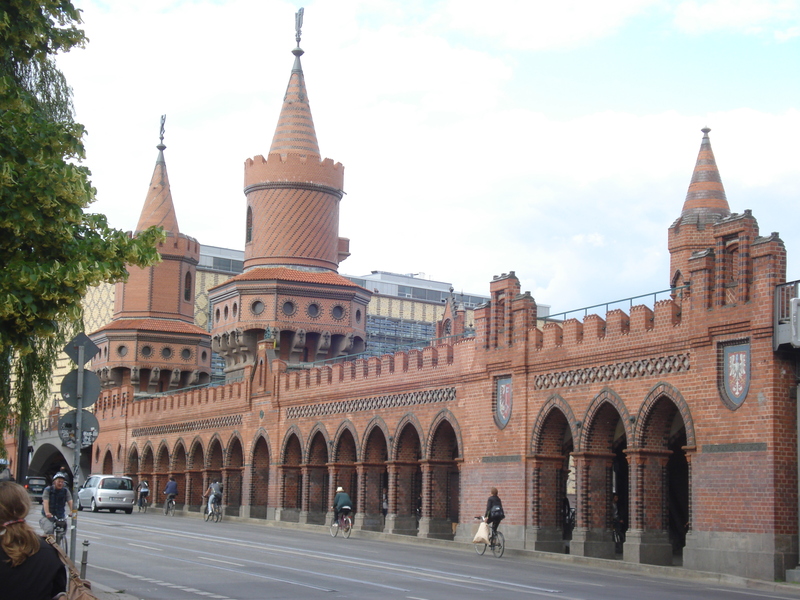 I went to the main city train station, Hauptbahnhof and bought a ticket to Gdansk, Poland for Monday. 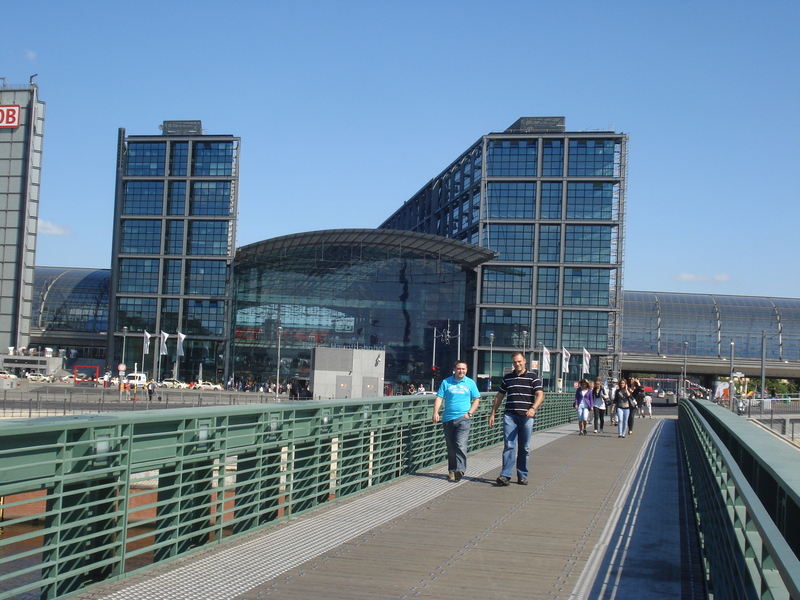 The station is huge and modern, very airport-like. 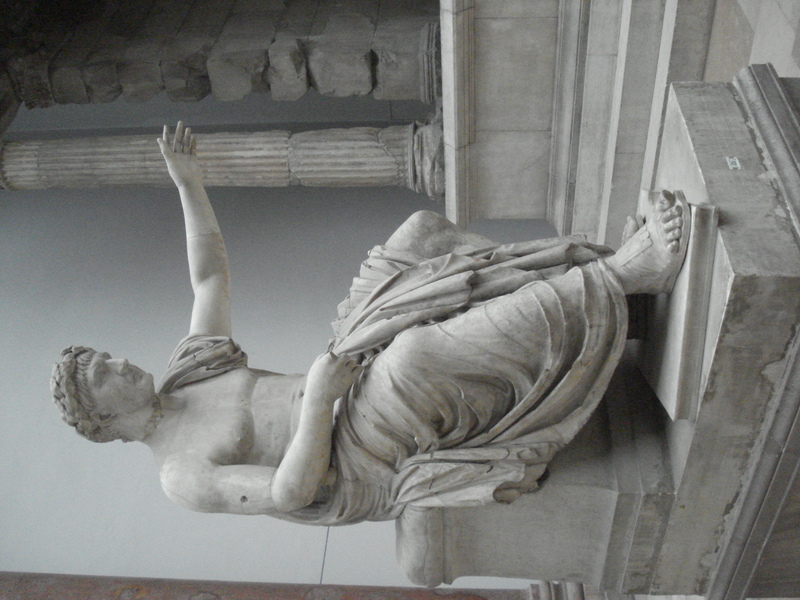 Next post will be about my visit to Museuminsel (Museum Island) in the River Spree. 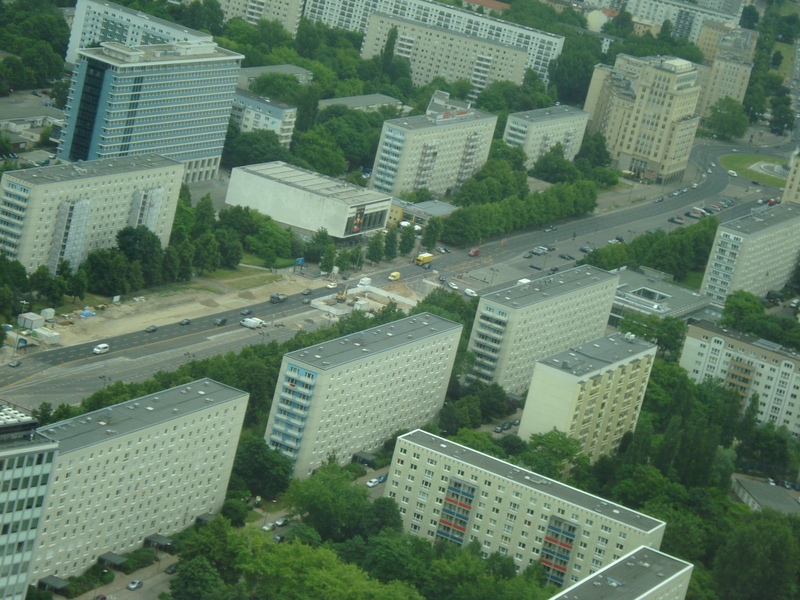 My hostel is in the old East Berlin. 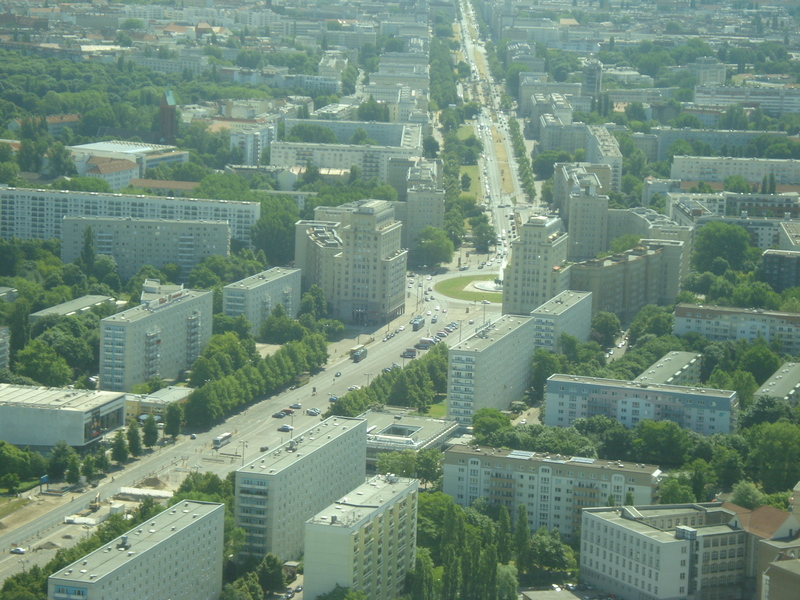 In the days when the city was divided, East and West Berlin were separated by The Wall, manned by armed guards. 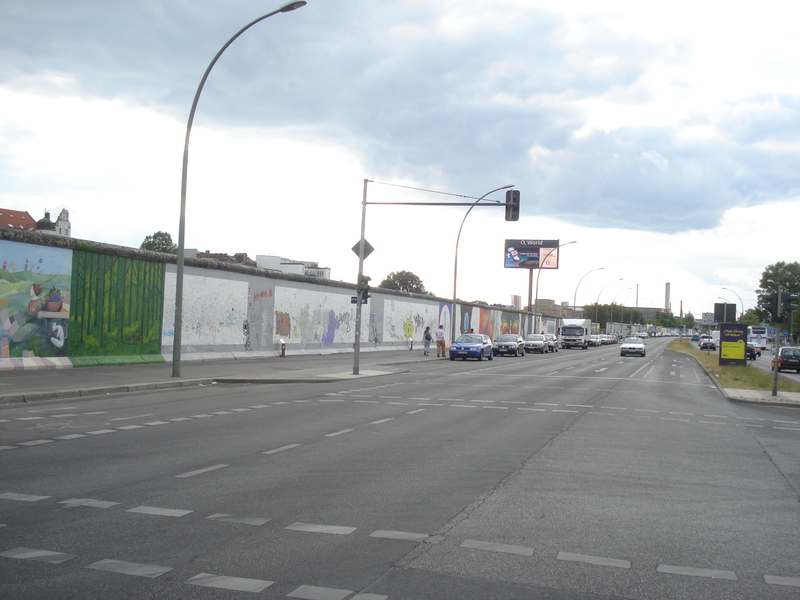 A 1.3km section of the old wall is still standing not far away. 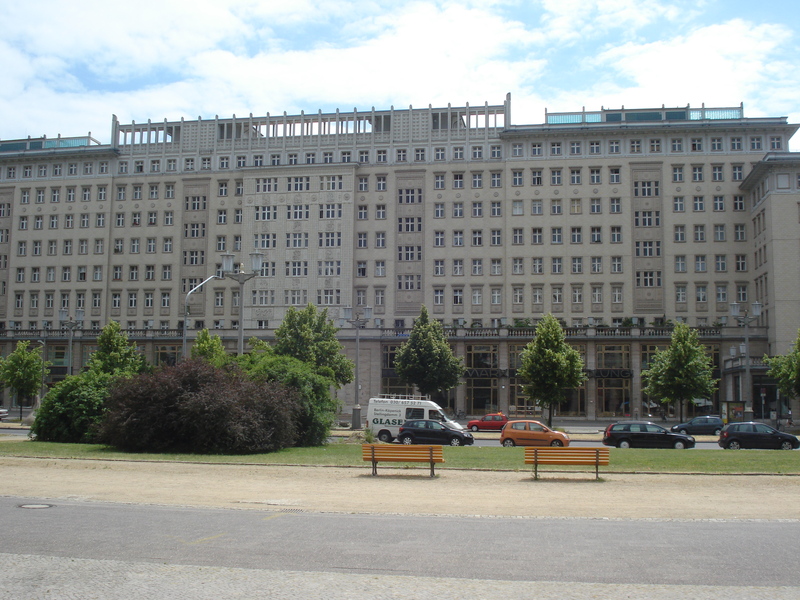 I took a walk to check it out. 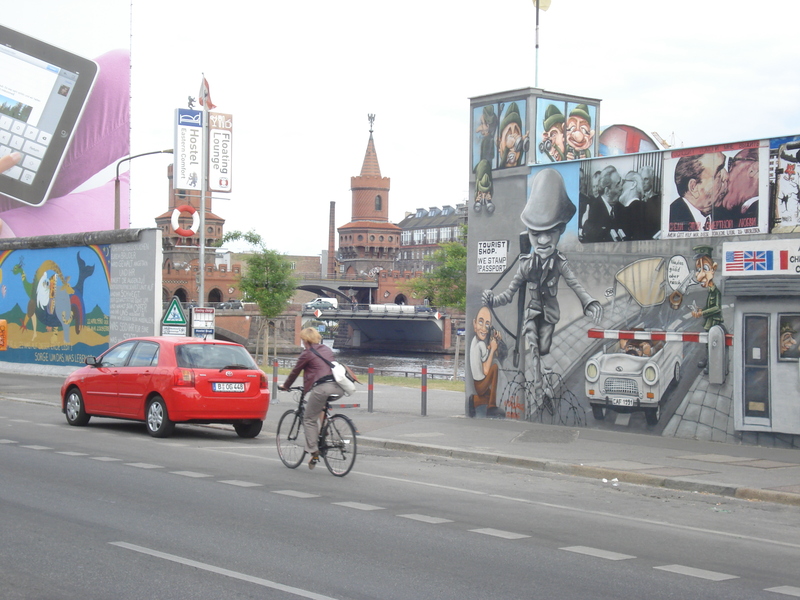 Since 1990 it has been painted over by 118 different artists from 21 countries, and is referred to as the “East Side Gallery”. 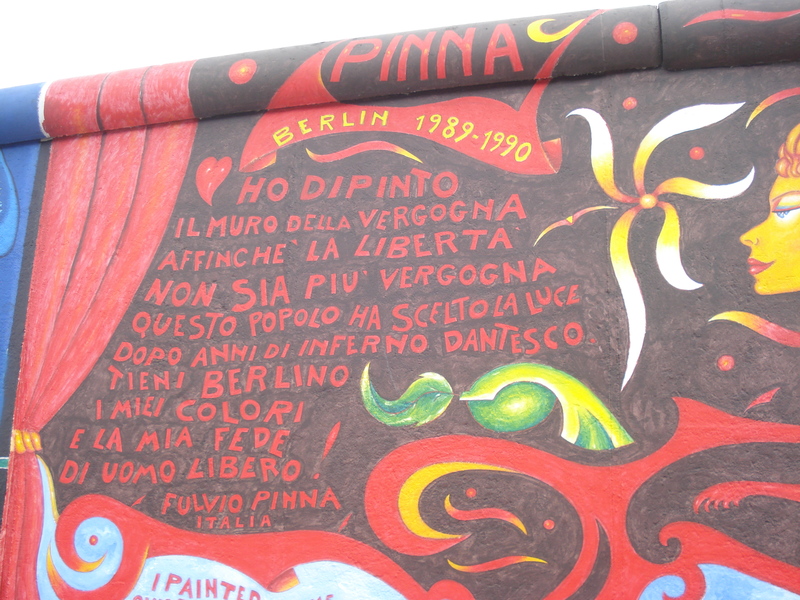 The last pic says in Spanish something like “I painted this mural to blot out the shame…”. 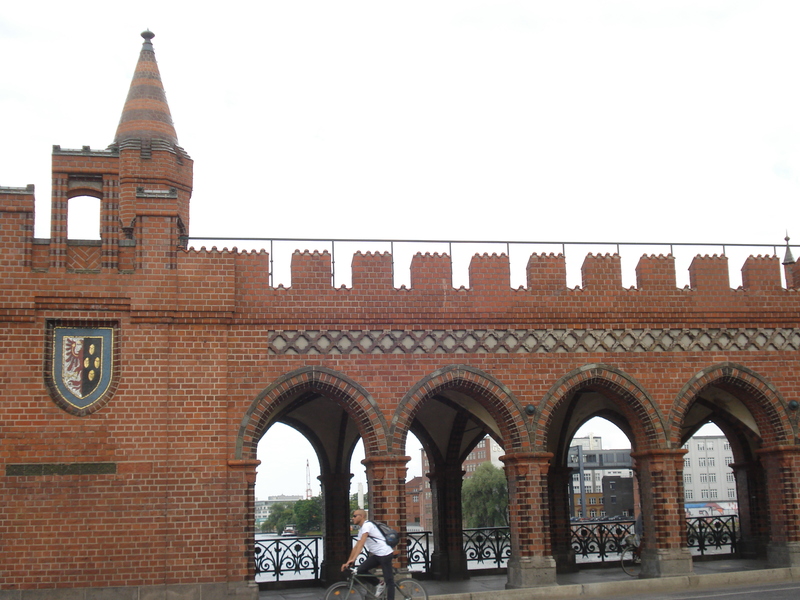 On the other side of this section of the wall was (and is) the Spree River. 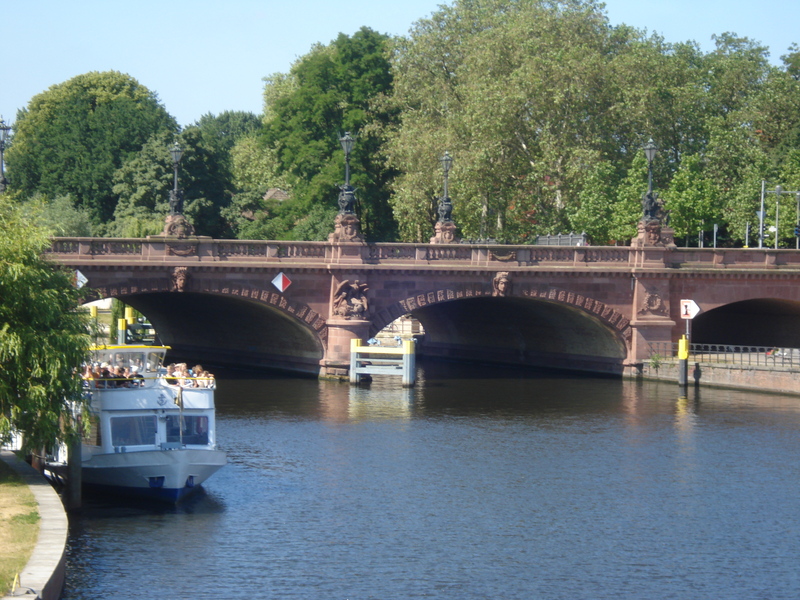 I walked on over the Oberbaumbrücke (brücke means “bridge”) to the suburb of Kreuzberg on the other side. Before the wall came down the bridge was pedestrian only, for the few with the paperwork to let them cross. 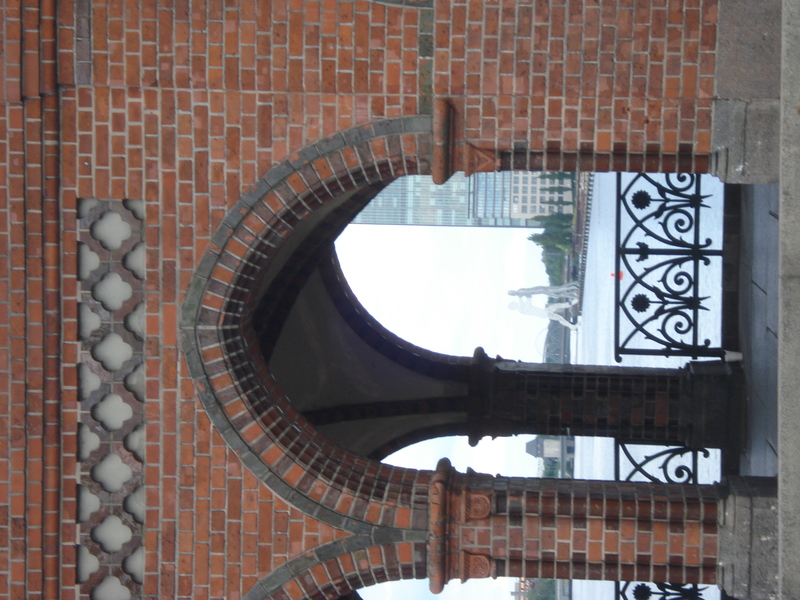 In the last pic, through the arch, you can just make out a sculpture in the distance beside the river. 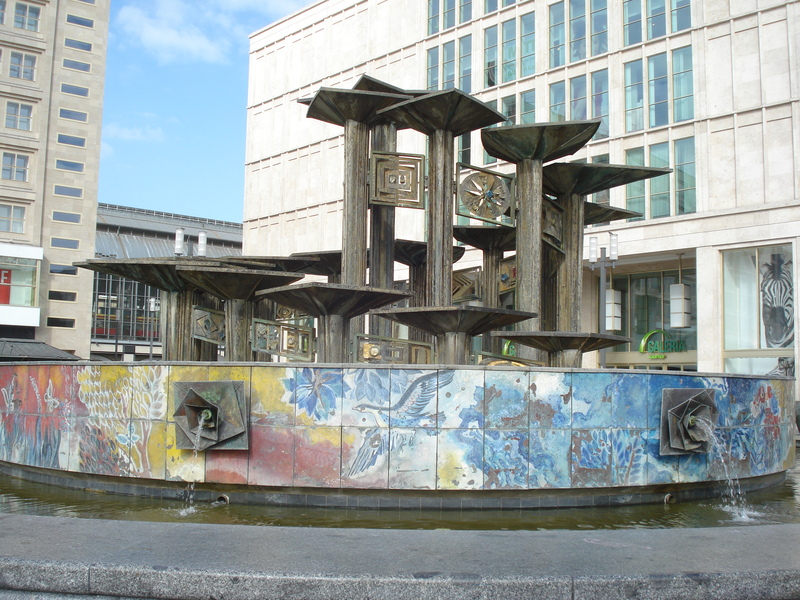 My googling tells me it is a 30m high, 45 ton sculpture of 3 men made of aluminium full of holes (symbolising molecules). If I get a chance I’ll take a closer look. Over the bridge I had a meal at a Vietnamese/Thai place, then a beer at “Wild at Heart” bar and music venue. 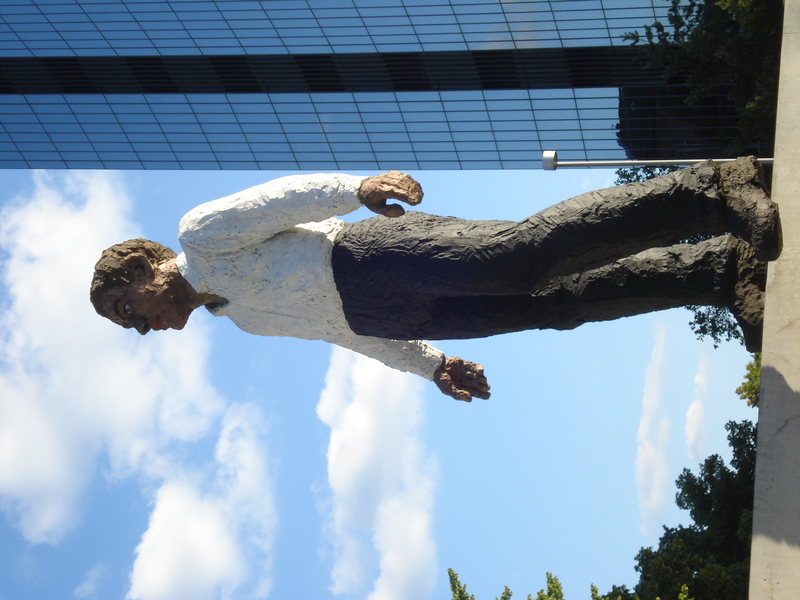 I think I’ll go back Friday to see “Woolly Bandits” from USA. I saw a poster today for a gig on Saturday by another 60s band, The Standells. The poster said “original line-up” !!! I am tempted to get a ticket, but I’ll see. The Standells and The Seeds (who some members of Woolly Bandits were in) are both bands with legendary status due to having tracks on the seminal compilation “Nuggets”. It was first an LP in the 70s, when some great 60s garage and psychedelic bands (most of which never made it internationally) were already becoming obscure. The original Nuggets spawned many sequels and spin-offs. I have the 4-CD USA-bands-only box set back home. 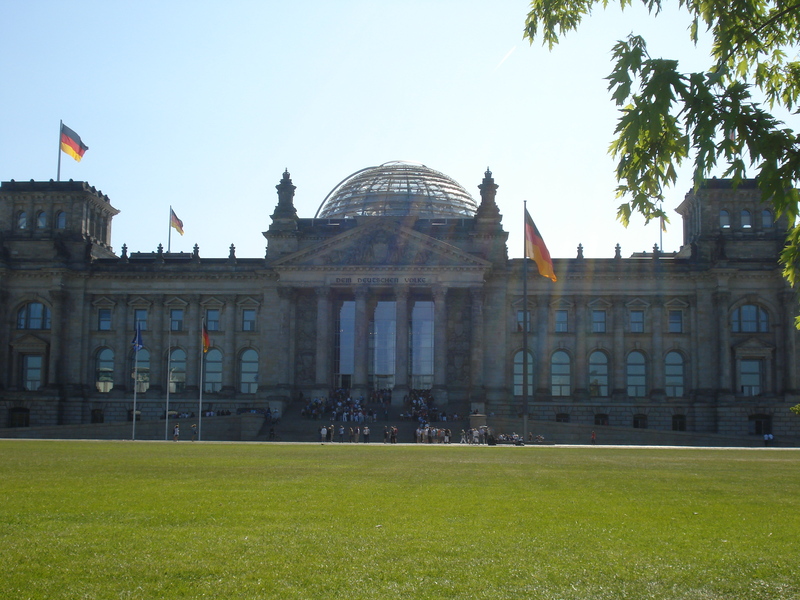 On Thursday I also went to look at the Brandenburg Gate and the nearby Reichstag. I’ll post pics of those tomorrow. 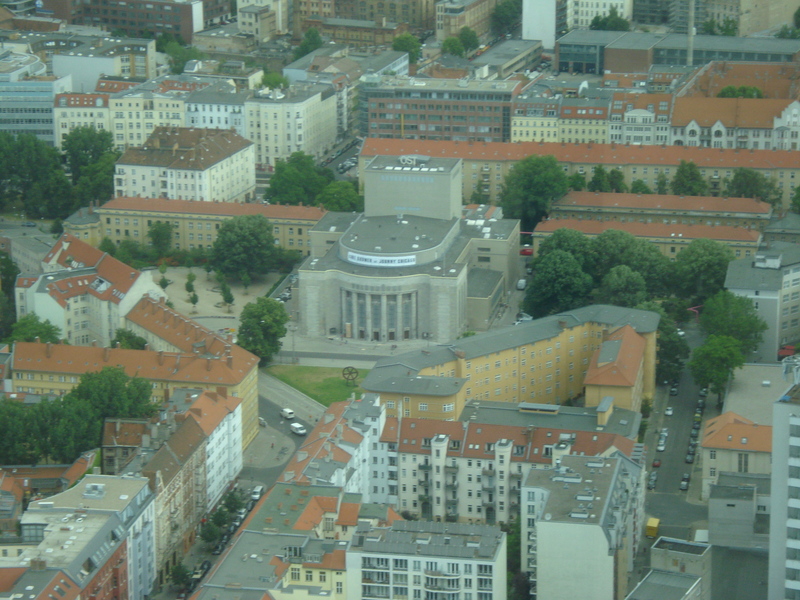 Berlin really stands out as different to everywhere else on my trip. 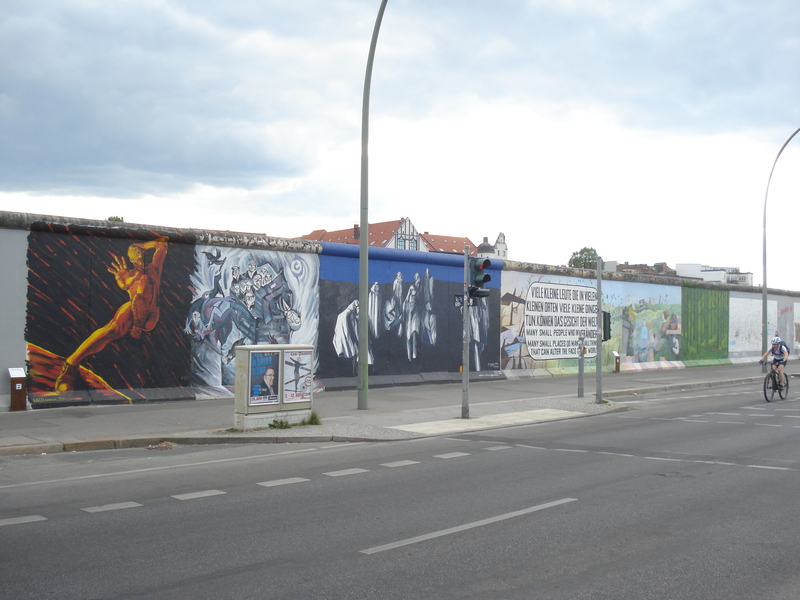 It is definitely Middle/East European though, in the sense that before the Wall came down, even West Berlin was just an enclave within the DDR (communist East Germany), lying behind the “Iron Curtain”, in Churchill’s phrase. 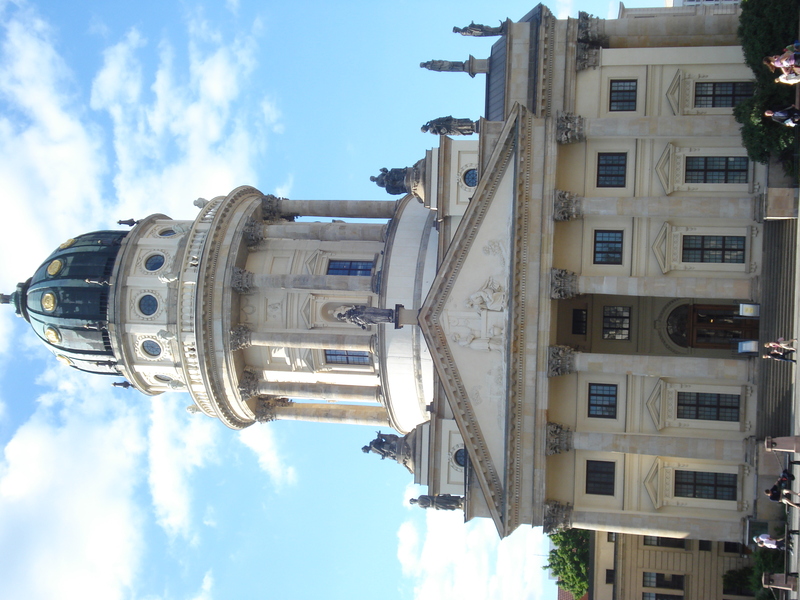 Nevertheless, all the other places I’ve been seem like provincial backwater towns compared to Berlin (even Vienna). I have a slight twinge of intimidation actually. Not in a bad way though. Everybody has been very friendly. 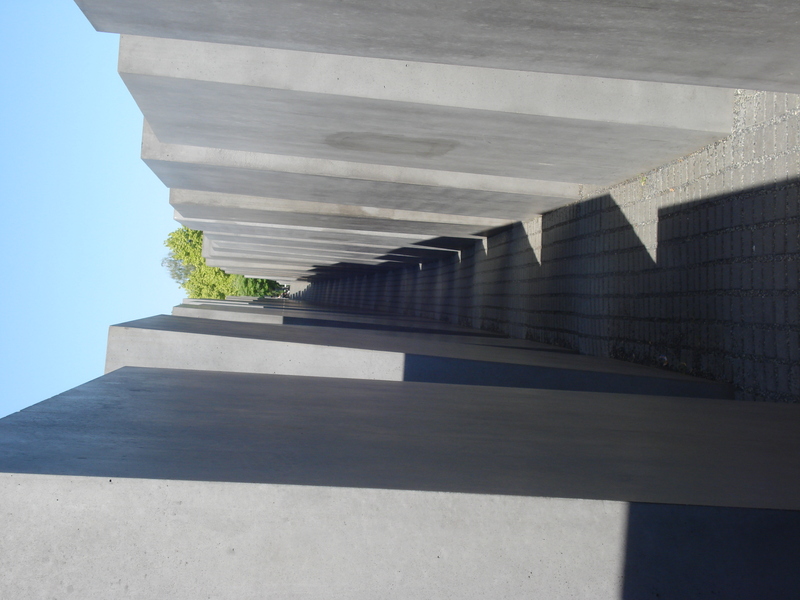 Of course, I knew Berlin was a major international city and would be exciting, full of life and non-stop activity, but knowing that theoretically and actually being here and experiencing it personally are two different things. 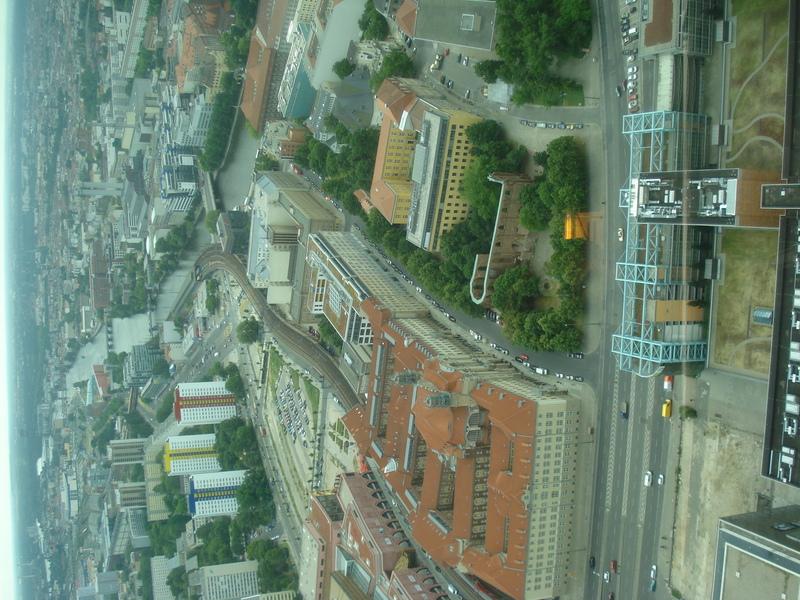 The adrenaline rush of Berlin is a bit draining though. Everywhere else I’ve been I’ve been quite relaxed, but here I find I am just a little bit more on edge much of the time. 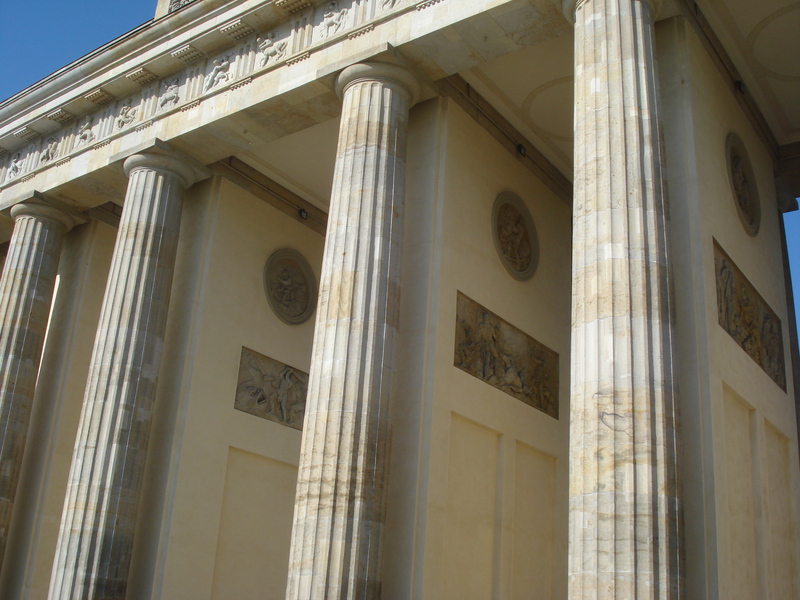 All this is just subjective impression (as is most of this blog). 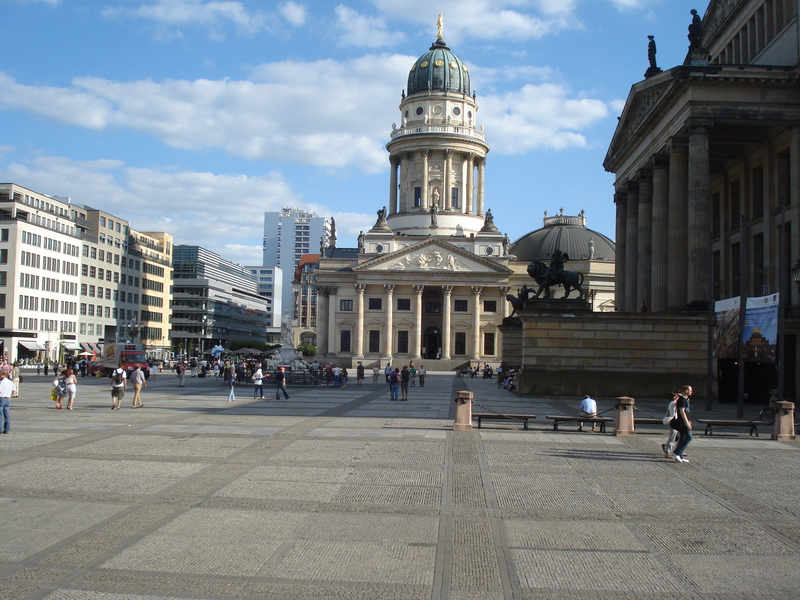 There is no way I can do and see all the things I would like to in Berlin, so I’ll just enjoy being here, do and see what I comfortably can and look forward to another visit some day. 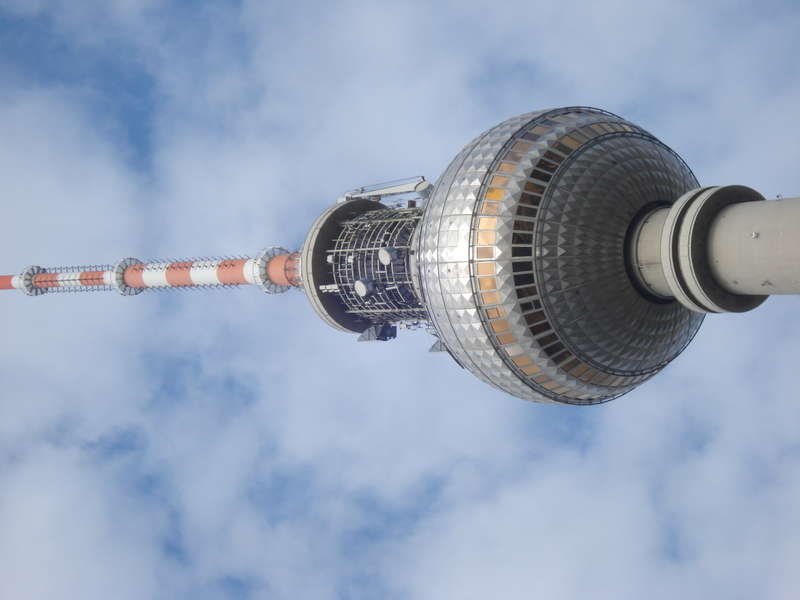 Here is the Fehrnsehturm, nearby Alexanderplatz and views of the city. 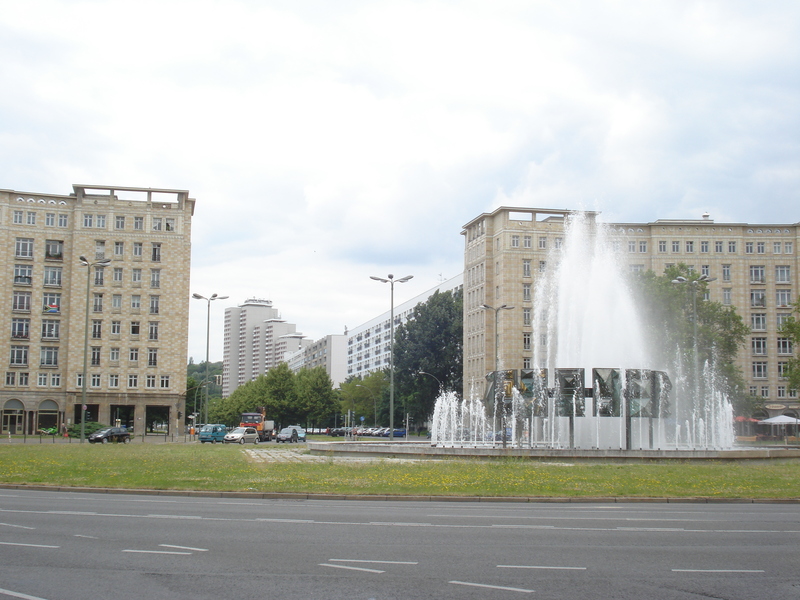 The last pics show the view up Karl Marx Allee to the roundabout at Strausberger Platz, which allowed me to judge the distance for my walk to my hostel in Friedrichsain. 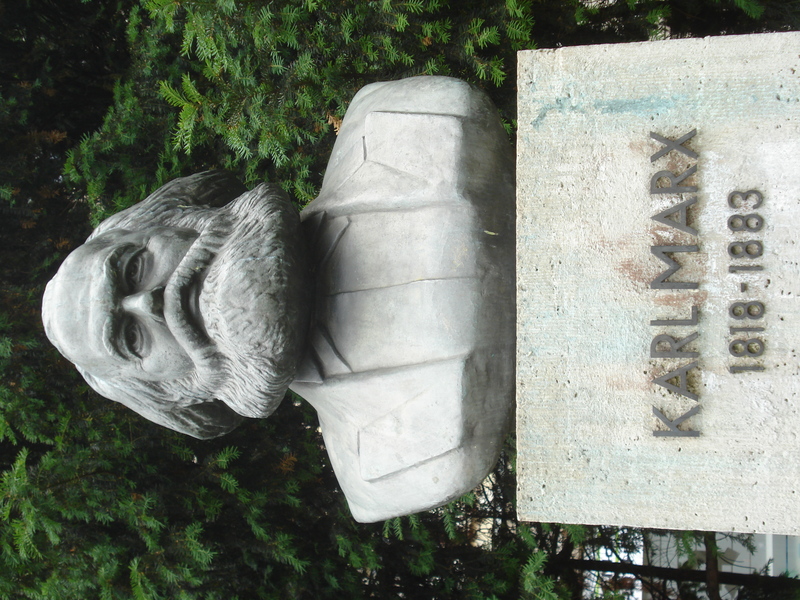 Next, my walk down Karl Marx Allee (first named after Stalin in the post-war reconstruction, until memorials to him fell out of favour). At last, the Sunflower Hostel. 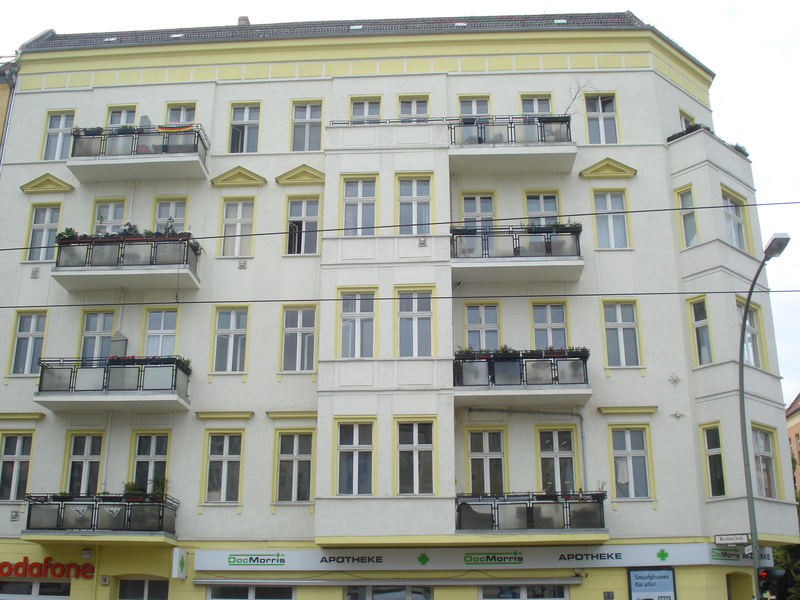 I checked in and went to look for the building where my friend Andrew had an apartment when he lived in Berlin a couple of years ago. 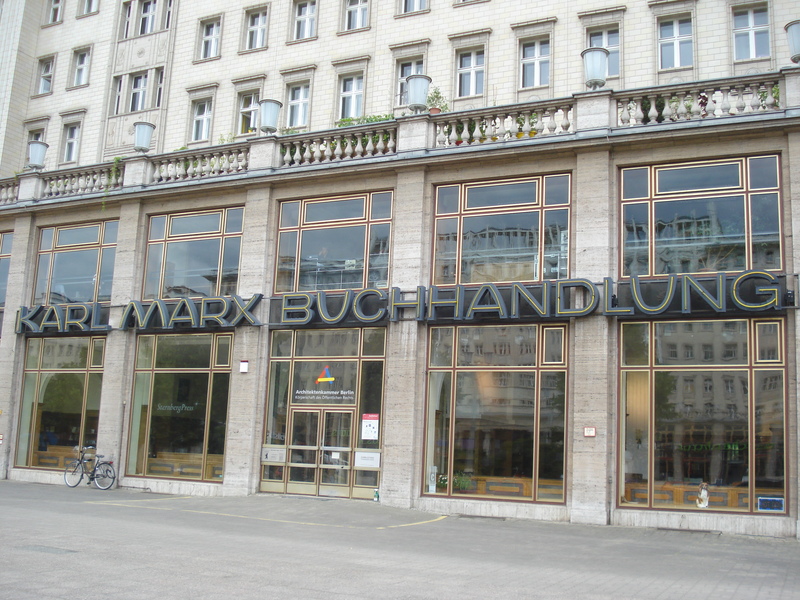 I think I found it (on the corner of Warschauer strasse and Gruenberger strasse). Maybe Andrew will post to let us know if I was right. Well, this has been long enough for one post. 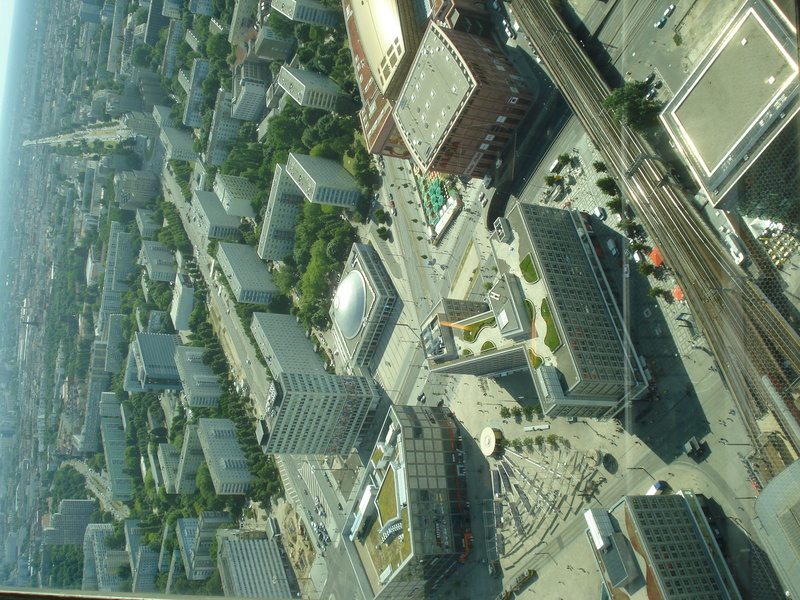 Impressions of Berlin to be continued next time. 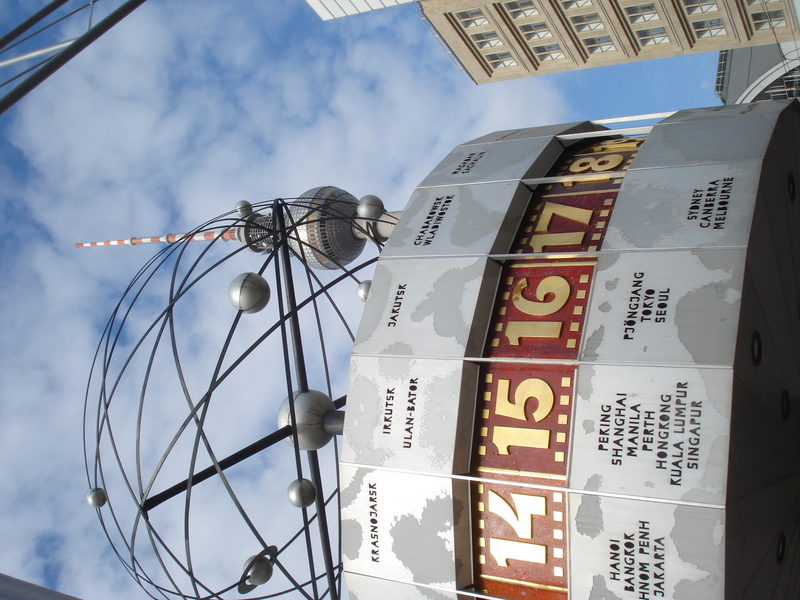 Got in to Berlin about 7.30 am (after setting the clock back again 1 hour). 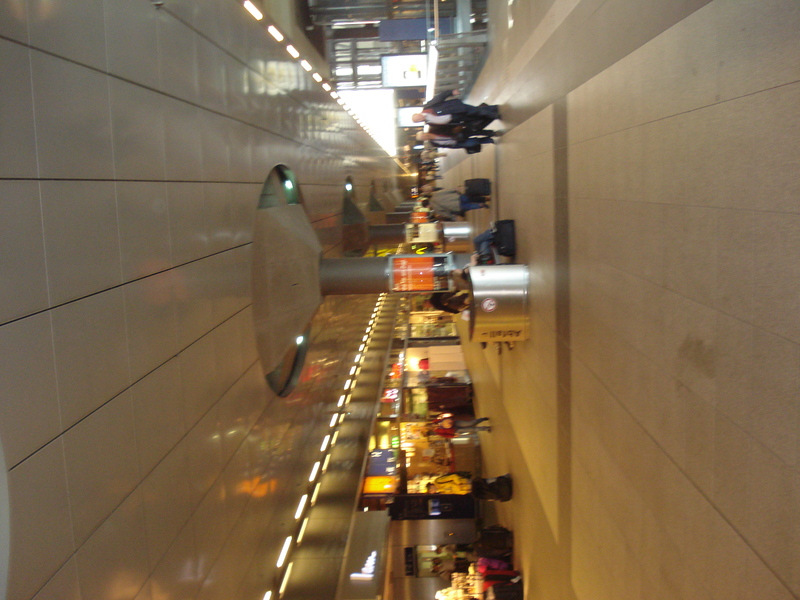 The airport (Schoenfeld) was next door to a train station. 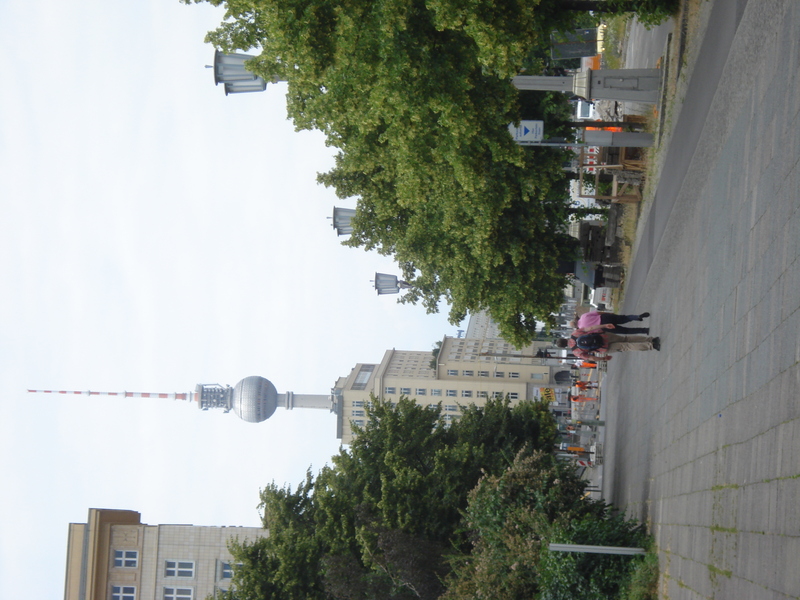 On the second stop I looked out the window and saw the Fehrnsehturm (TV Tower), a Berlin landmark. 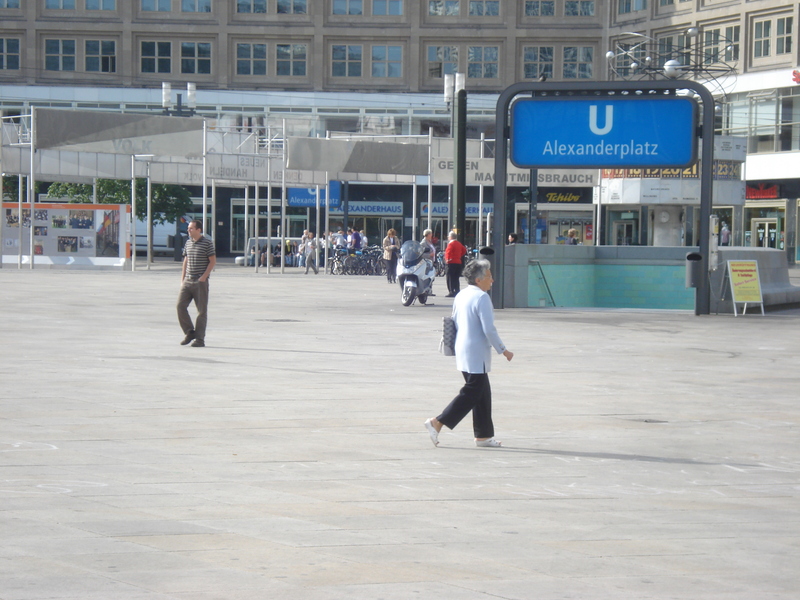 Next stop (Alexanderplatz) I was there! By then it was 8.30am, and the viewing platform opened at 9.00am, so I grabbed some coffee and a breakfast nibble and sat under a tree. 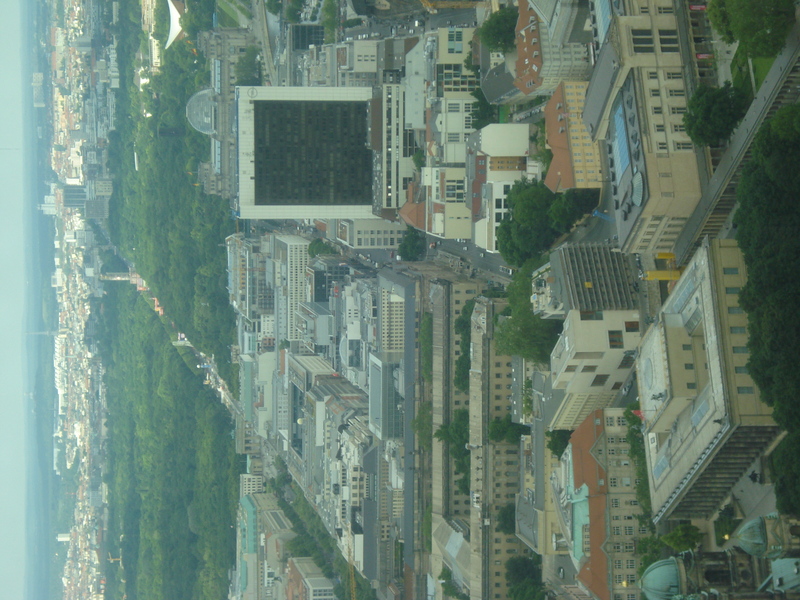 Then I went up and surveyed the terrain. 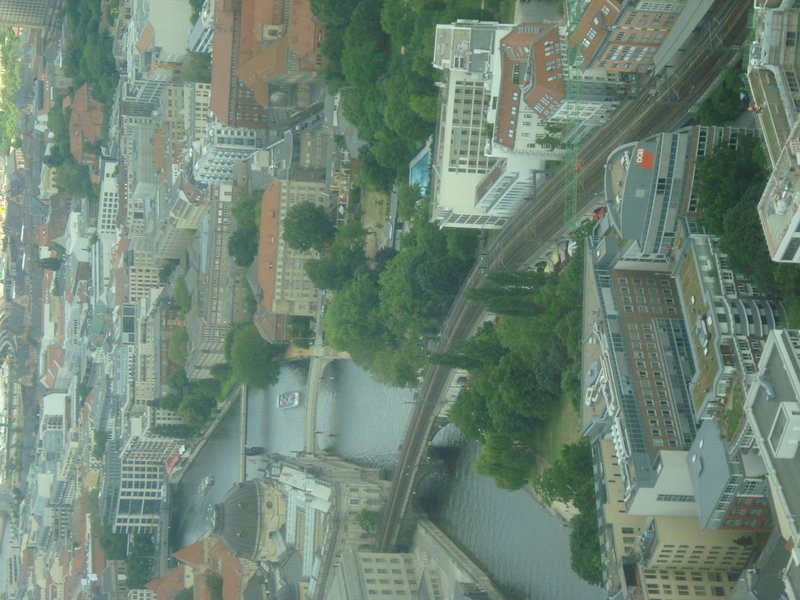 The view was magnificent. 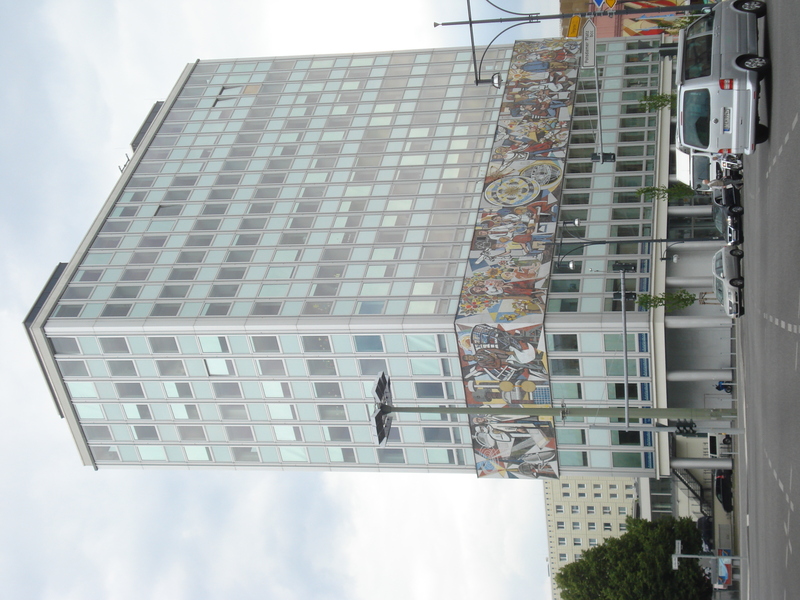 I had a map to get to my hostel (Sunflower) in the suburb of Friedrichhain, but actually looking at the route I planned to walk (along Karl Marx Allee) was very helpful. The walk was very leisurely. I stopped for lunch. But by mid-afternoon I made it there. 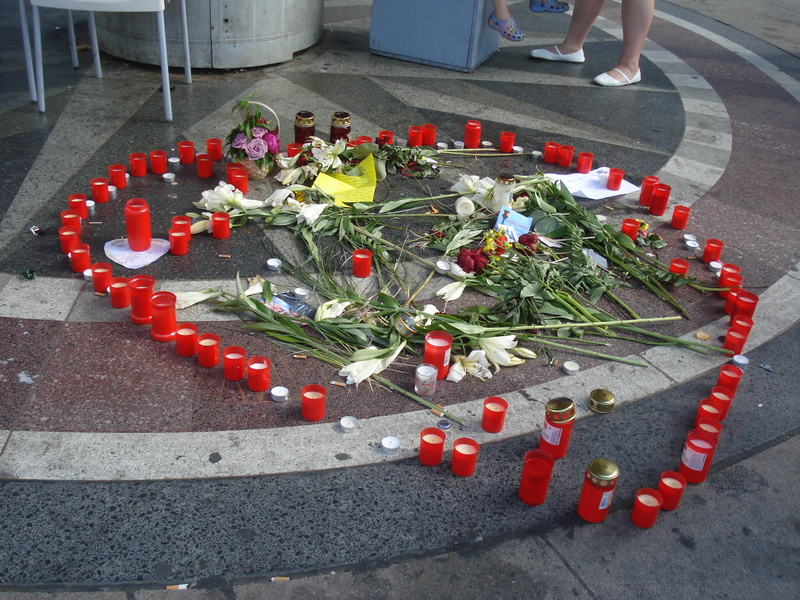 It’s in a relatively quiet nook of a very lively area. Details soon. 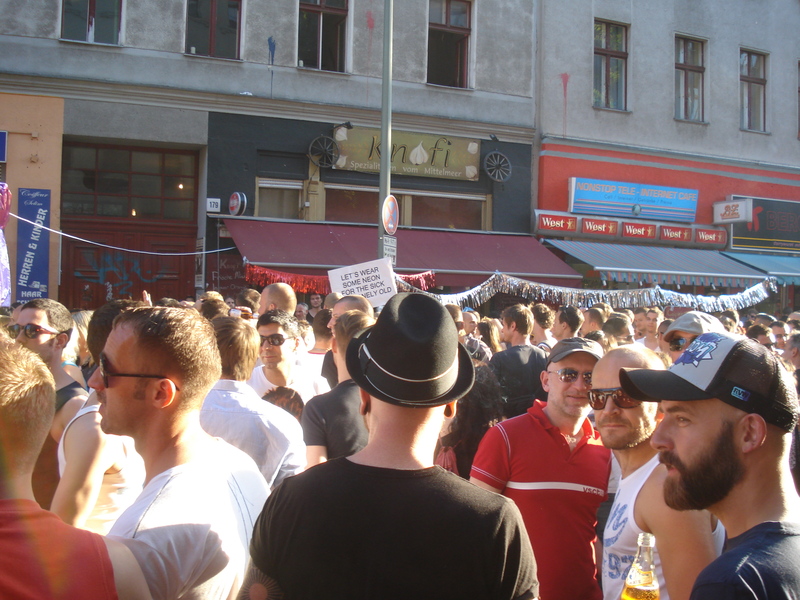 Just got back from watching the Germany-Ghana World Cup soccer match in a bar in the nearby area of Kreuzberg. Germany won 1-0. 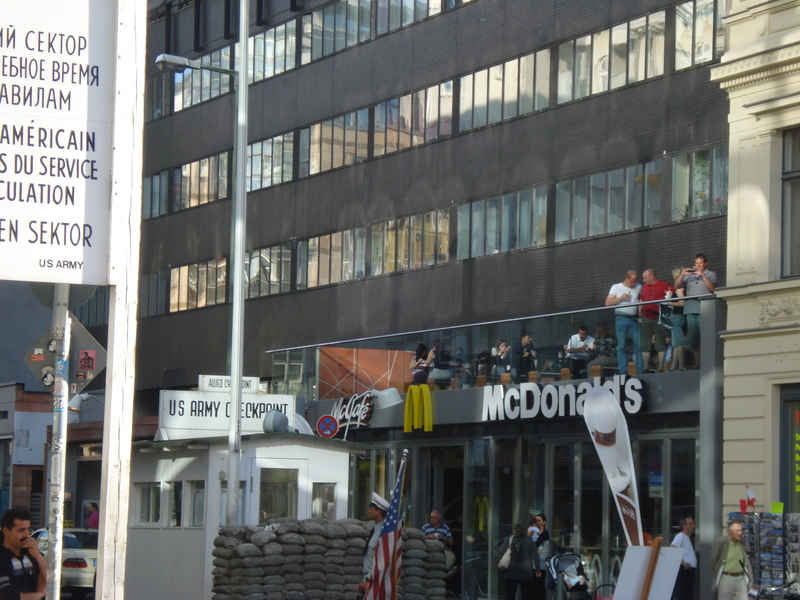 People were going off, car horns blaring, fire crackers exploding…You would think they had beaten Brazil! The bar (Wild at Heart) stages music gigs most nights. I am going back Friday night to see a band “Woolly Bandits” claimed to have some members of the legendary 60s USA garage band “The Seeds”. Those guys must be seriously old by now. As were some of the members of “Ten Years After” that I saw in Budapest. Oh well, you are only as young as you feel! Pics soon.